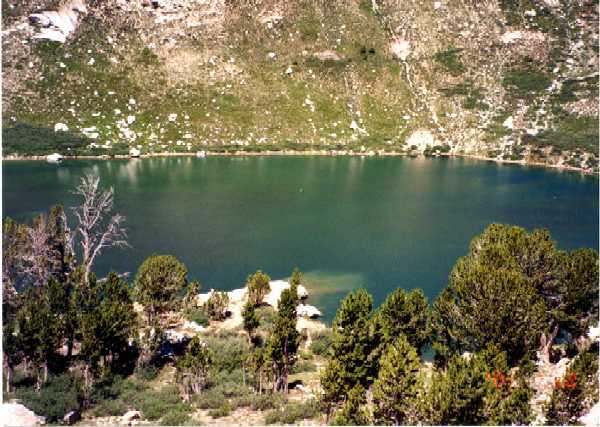 The twelve pages of this site contain trail and off-trail hiking information for accessing all the named lakes in the Ruby Mountain range and the adjoining East Humboldt range in Northeastern Nevada (25 lakes total if the three double named lakes, Cold, Hidden and Dollar, are considered as one each and the Soldier Lake ponds are considered as just one). A chart in Part 6 outlines the relative hiking difficulties from easy to very difficult to the various destinations. The more difficult ratings usually refer to destinations without trails where steepness, loose footing, rocky terrain and dwarf willows describe the trail of the day. Most trail destinations are certainly within the capability of the average hiker. Many of the images display the copyright symbol © but these can be disregarded and permission, without asking, is granted to use any of the photos on the site. Note that postcards can be made from any of the site's photos or from your own digital photos. 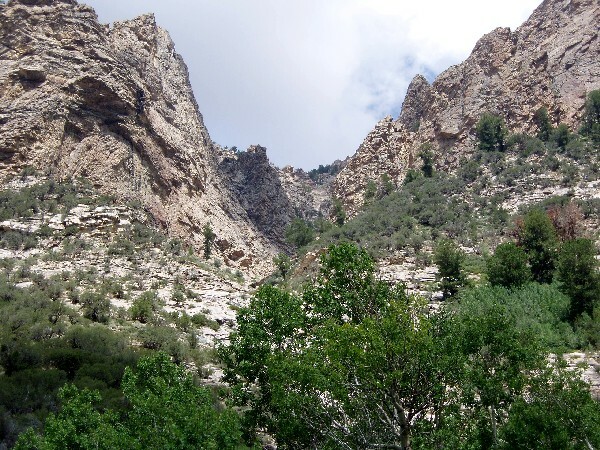 For information go to: Hiking Right Fork Canyon--Convert Photos to Postcards. 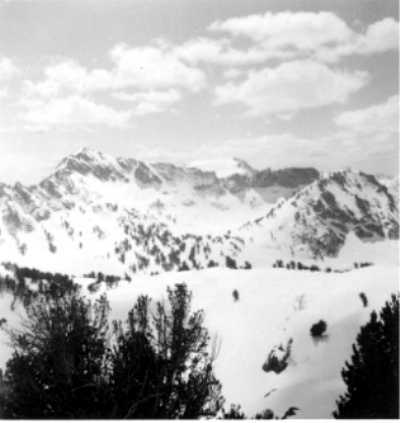 The two mountain ranges, the Rubies and East Humboldts, are separated by a mountain pass (Secret Pass), and it is customary to think of the entire range as being the Ruby Mountains only. Whenever possible, with the exceptions of some trails over privately owned lands, explicit directions are furnished for locating the access roads and trails that lead to these destinations. Comments are made on the fishing potential for each lake. Information for any particular lake is not necessarily confined to a single page but may exist on two or three pages. Part 2 Supplement Other Wilderness Areas contains a Lake Name Directory chart that identifies the pages where information can be found for most of the named lakes. Rock climbers using ropes and pitons have been observed dangling from shear cliffs in Lamoille Canyon, but the entire area is primarily a hiker's paradise. Most hikes would be considered moderate in difficulty, requiring only average hiking ability, and round trip distances are roughly in the vicinity of three to eighteen miles. 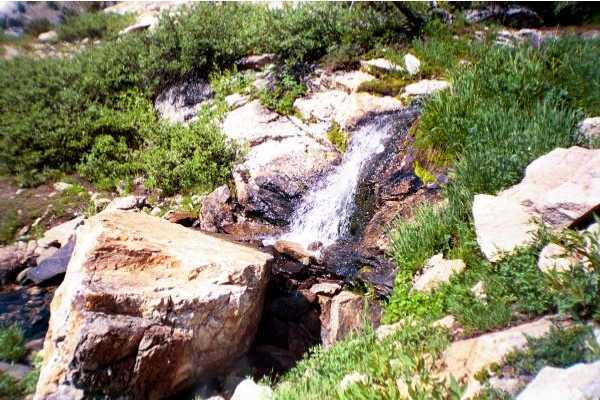 The classic hike over Liberty Pass is on a well maintained trail and is easier than many of the other hikes. ...but there won't be any need for fixed ropes. Click on the image icons for expanded views. 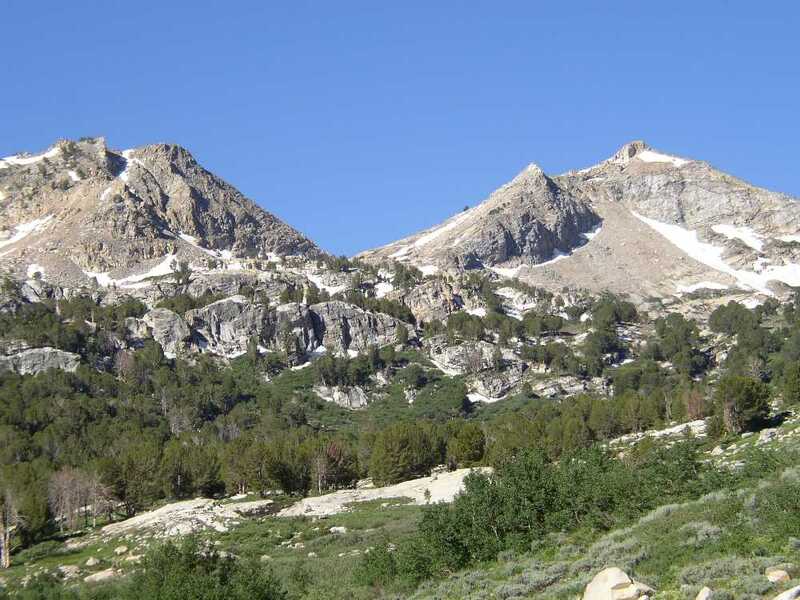 This is the current page and beginning with the section entitled Lamoille Canyon, the first seven miles of the Ruby Crest trail from the parking lot in Lamoille Canyon to North Furlong Lake are described in some detail. 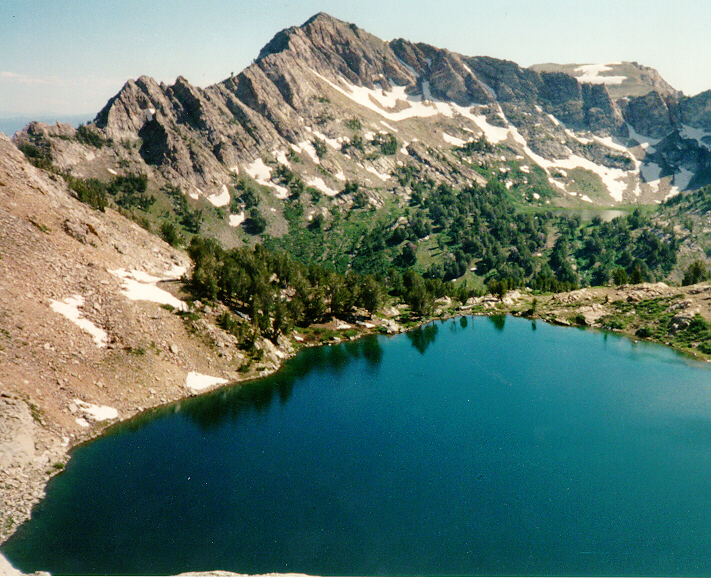 The first five miles of the trail, passing Dollar and Lamoille lakes, continuing over Liberty Pass and then down to Liberty, Favre and Castle lakes (but not all the way to N. Furlong), is the most popular hiking area in the entire mountain range and should be the primary consideration for anyone making a first time trip to the area. The only other destination included in Part 1 is to Island Lake, also a good first time destination. Lamoille Canyon however, due to popularity and easy access, is the one area where you cannot go to completely escape civilization. Depending on the day and weather, cars may be parked most anywhere along the 12 mile stretch of canyon road, and there could be 50 or more cars parked at the end of the canyon. 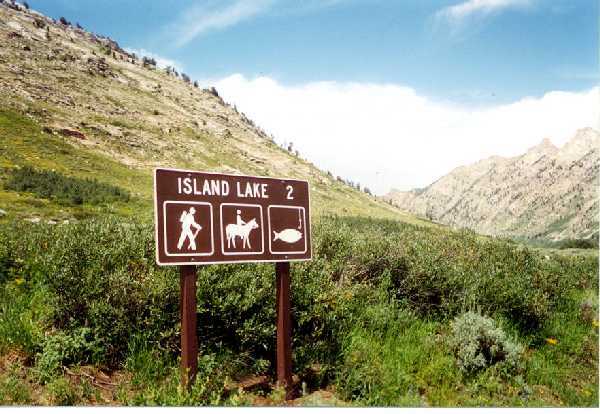 Some people will just be taking in the scenery, others fishing Lamoille Creek, while most of the others will be on the trail to Island Lake or going the other direction towards Liberty Pass and beyond. Above Photo Courtesy of Susan Zerga Photography, P.O. Box 281327, Lamoille, NV 89828. Susan Zerga photography can be viewed and purchased at the Northeastern Nevada Museum and other Elko locations. 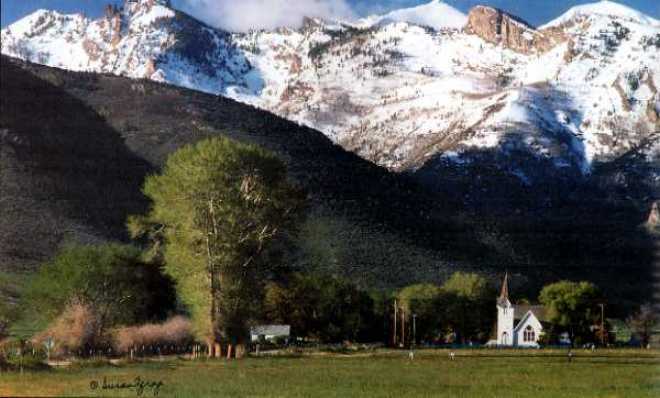 The Rural Gothic style steepled church at Lamoille, some 20 miles from Elko, has the reputation of being the most photographed building in Nevada. Construction was started in 1905 and continued with periodic remodeling and expansion. 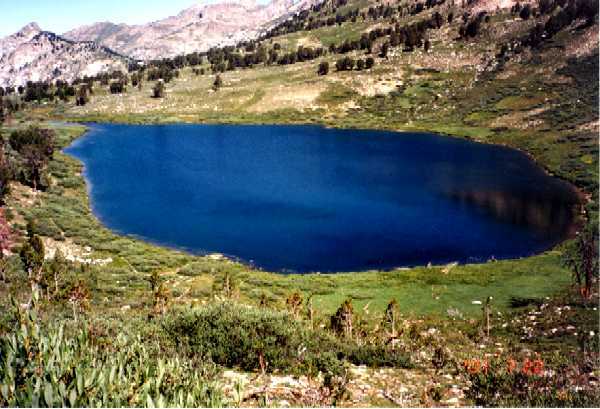 Hiking destinations in Part 2 include Angel, Winchell, Smith, Greys, Boulder, Steele and Birdeye lakes in the East Humboldt range and Robinson, Soldier, Hidden, Cold, Verdi, Overland, Echo, Seitz and Griswold lakes in the Ruby range. Contact information is provided for five major horse Outfitters in the area in case you would rather ride than walk. Part 2 supplement provides additional hiking information and photos for Robinson, Soldier, Hidden, Seitz, Griswold, Lost and Winchell lakes. 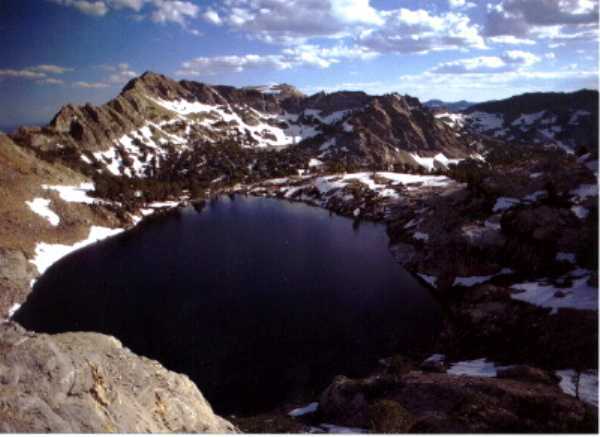 Information and photos are also presented on the unofficially named Box Lake and Snow Lake located in Box Canyon over the west side of the ridge above Lamoille Lake. 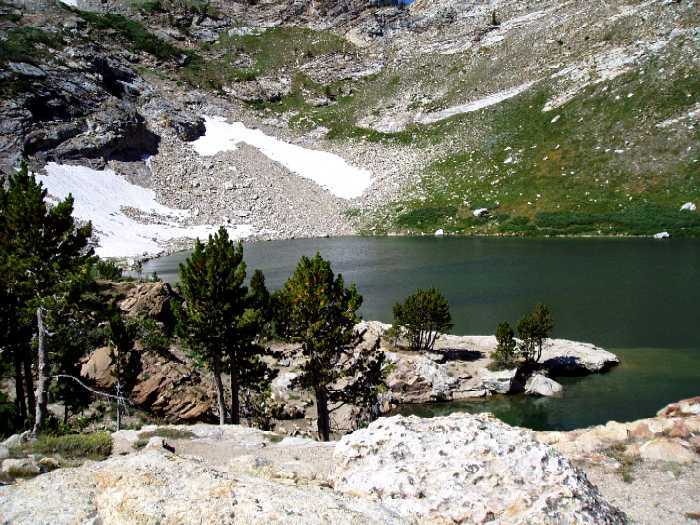 This section provides pack trip information and photos with several outfitters to Hidden, Robinson, Soldier, Seitz, Boulder, Steele and Cold lakes. 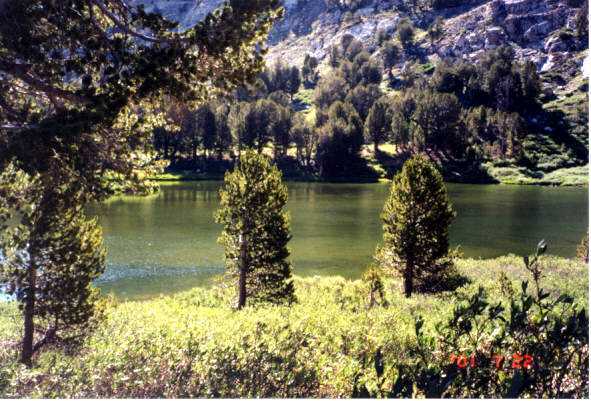 Reservation information is provided for the Thomas Canyon campground just off Lamoille Canyon and the Angel Lake and Angel Creek campgrounds in the East Humboldts, the only three major campgrounds in the Rubies and East Humboldts. This page provides information on a few of the more unusual and less visited destinations and the outfitters who can get you there. 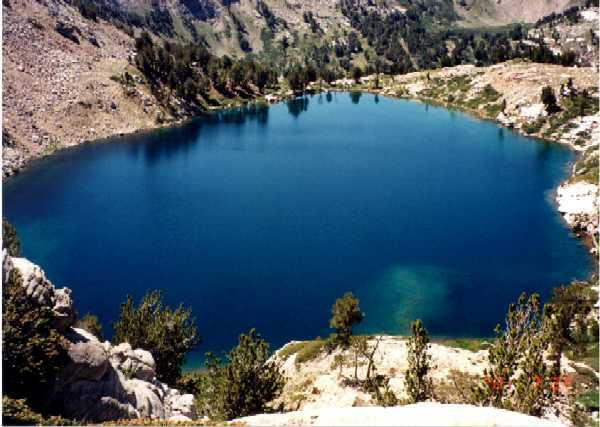 These include Echo Lake, Verdi Lake, Lost Lake, Greys Lake, Hole in the Mountain, Goat Lake (Right Fork Canyon) and hiking information for Thomas Canyon. 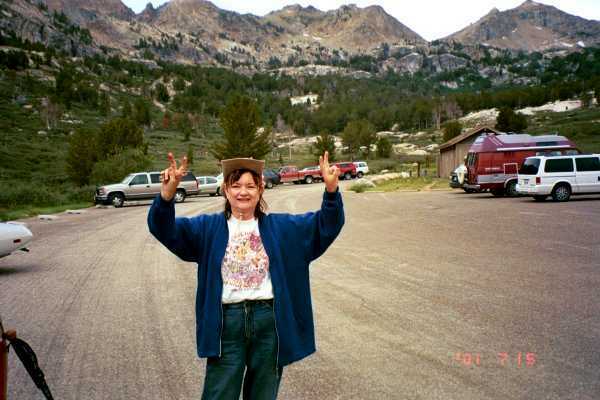 This is a very inspiring account of a four day hike over the 42 mile Ruby Crest Trail (starting at Lamoille Canyon) by two ladies from Minden, Nevada that is told by Lynda Mellows. This section presents additional horse trip information to Birdeye, Lost, Verdi, Overland and North Furlong lakes and to Lake Peak. Smith Lake and the Cave Creek cave are also covered. Cave Creek emerges from a granite wall within the Ruby Mountains, and in 1865 a soldier intent on exploring the cave met a disasterous end. Read about the two conversations in the cave between the ghost soldier and an individual who assures us he is completely sane. Ruby Crest Trail information is presented along with an abbreviated trail route that passes all the same lakes along the full length trail but reduces the distance from 42 miles to 30 miles. 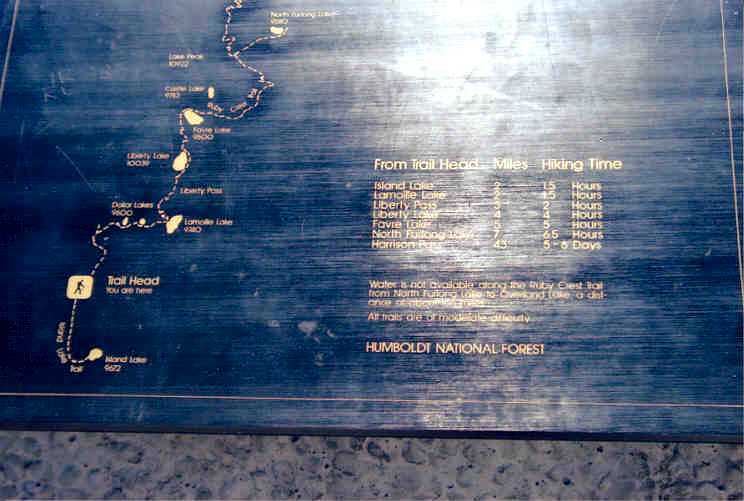 This section displays a chart with numerical ratings indicating a difficulty factor from easy to very difficult for hikes to all the named lakes and a few other destinations. Most destintions can be reached by horse and outfitters are identified who can provide horse transportation to the areas. A Summary of Hiking Destinations following the chart recommends the two hikes that should be undertaken as first time hikes; what destinations are available for later hikes without encountering private land; and what destinations are primarily recommended with an outfitter (due to trail difficulty or the necessity to cross private land). Consult this section when considering a hiking or horse trip. A Boeing B-17 Flying Fortress crashed in the East Humboldts during the early 1940's and a C-47 crashed about five miles away in the early 1950's. 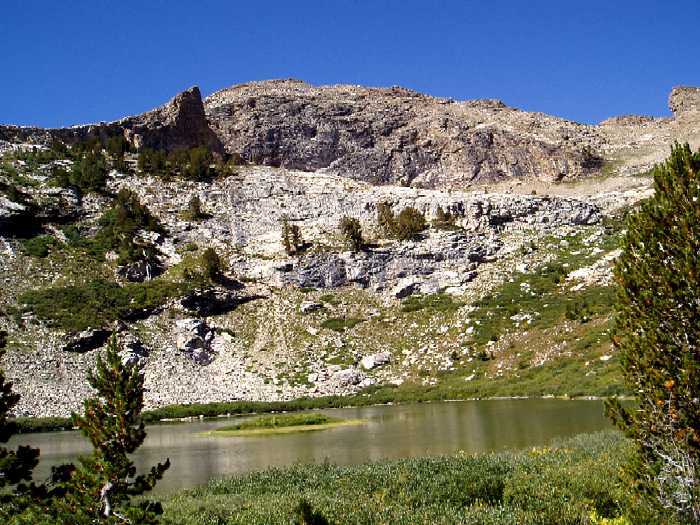 Nevada's Swiss Alps, the Ruby Mountains Wilderness and East Humboldt Wilderness, are centrally located 20 miles south of Elko, Nevada, near the ranching community of Lamoille in Northeastern Nevada. The mountain range is within the Humboldt National Forest and is approximately 90 miles in length and a dozen or so miles in width. The northernmost 70 miles, extending from Angel Lake in the East Humboldts to Harrison Pass in the Rubies, account for 99 percent of the recreational activity. 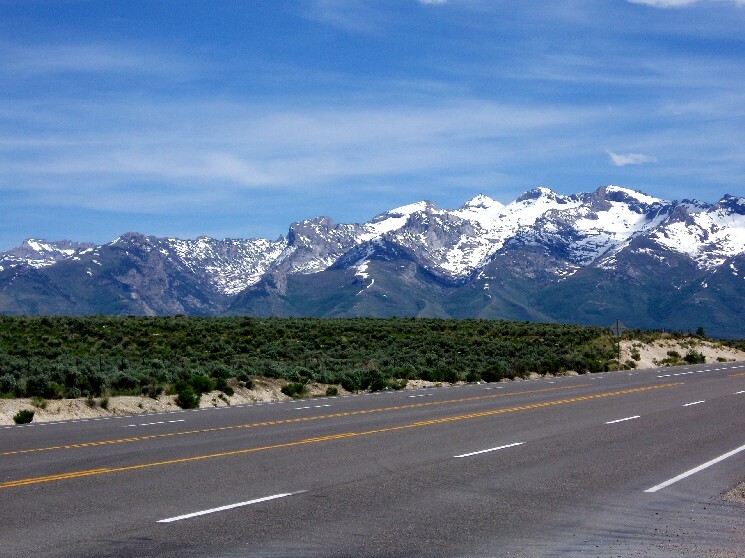 The range runs approximately in a north-south direction, and Secret Pass, one of two road passes that traverse the range, separates the East Humboldt section of the range to the north from the Ruby Mountains section of the range to the south. The mountain range is gently sloping on the west side and steep on the east side. The elevation is in the 10,000 to 11,000 foot range, not particularly high, but the range is formed by a single 5,000 to 6,000 foot rise rather than by a series of foothills. 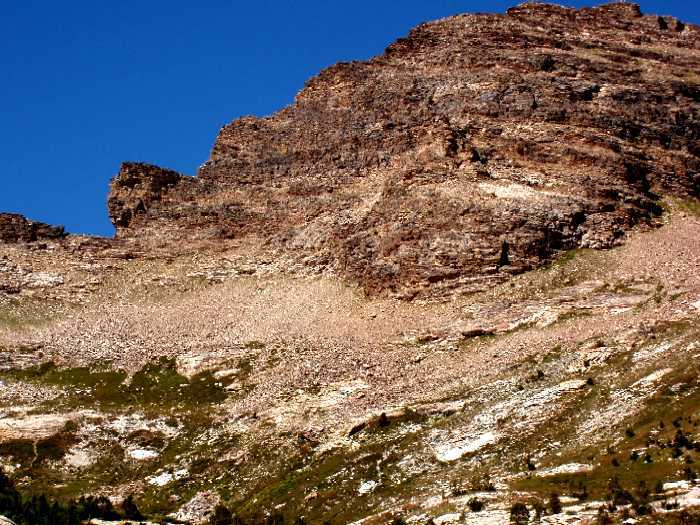 The elevation of nearby Elko is over 5,000 feet, and the Ruby Crest trailhead elevation at the head of Lamoille Canyon is around 8,800 feet. The 42 mile Ruby Crest (Harrison-Lamoille) trail, extending north to south in the Rubies, is the longest trail in the two mountain ranges. The narrowness of the mountains, ten to twelve miles, provides a wide variety of shorter trails, three to eighteen miles round trip, to the various lakes or other destinations. With an early enough start, most of these round trip destinations can be accomplished in one day. Twenty-five named lakes (or 28, depending on your counting method) and a number of small unnamed lakes or large ponds are scattered throughout the length of the range. Most of the named lakes are stocked with various species of trout, primarily cutthroat, brook and mackinaw (the latter in only two lakes). Trail maintenance by the Forest Service is sometimes lacking, but the Sierra Club, operating with the Forest Service, occasionally conducts trail reconstruction in limited areas. 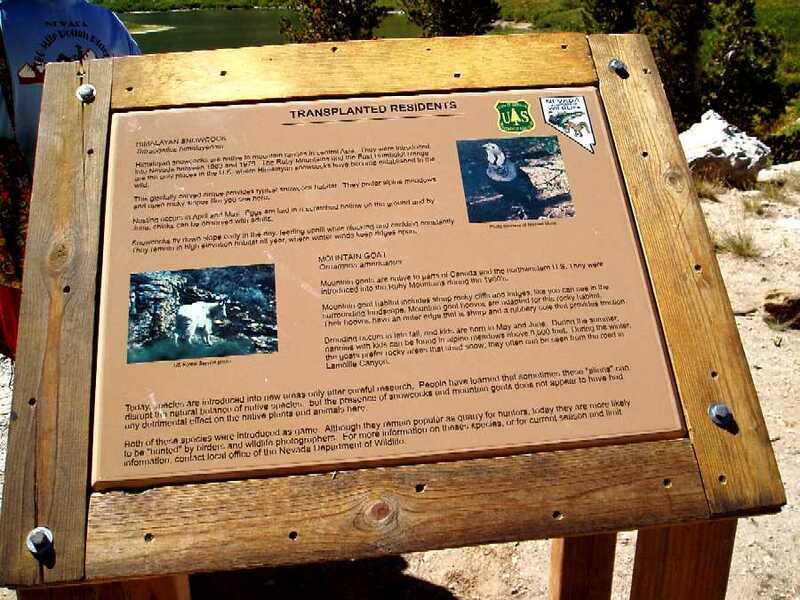 For summer 2007, trail maintenance was scheduled from August 4th through the 12th for trail or trails leading into the Boulders area in the East Humboldt range (a continuation of the Ruby Mountains range). The fee was shown as $595 and the Sierra Club announcement states: "Our base camp will be in an aspen forest next to a creek and about a half mile from Boulder Lake at an elevation of 9,039 feet." However, as often happens, there were insufficient sign-ups to proceed. The above trail location refers to the trail into the Boulders area via Pole Canyon on the Clover Valley (east) side of the range. This trail crosses private property and is not available for general access. At the time there was consideration by the Forest Service to purchase the necessary land for access but excessive cost of the land overruled. 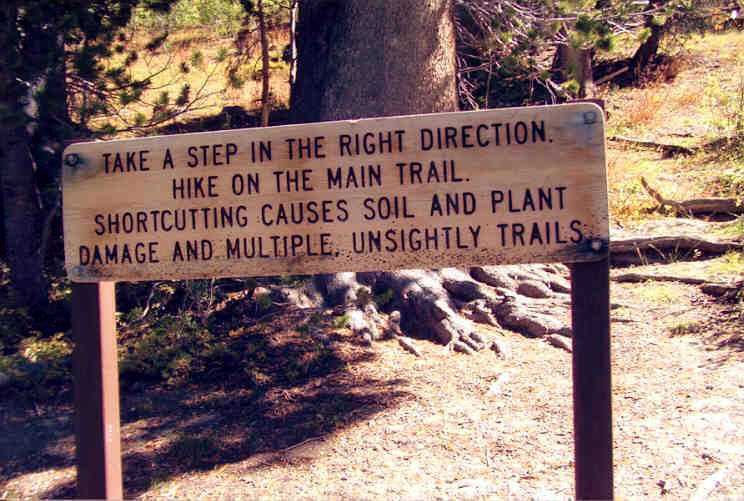 Accordingly, it is probably just as well that the trail maintenance did not proceed. See Parts 2 and 3 of this site for Boulder and Steele lakes information and the current state of the existing, or more precisely, non-existing, trail via Third Boulder Creek Canyon from the west side of the range. One topic of irritation concerns the lack of general public access to some trails and canyons that are bordered by privately owned property where Forest Service easements could not be obtained. These restricted areas are mostly on the west side of the mountain range. Outfitters, however, usually have agreements with the land owners to take clients into these areas. 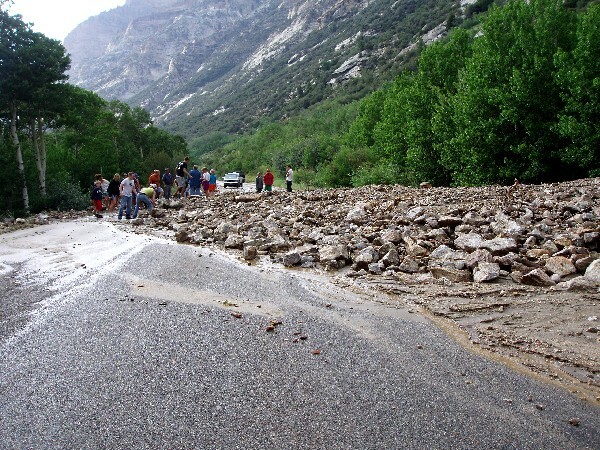 There are no access restrictions in the Lamoille Canyon area and beyond. Click the map image to expand to full size (file size is 279k so loading time may be slow). The map will show the locations of many features mentioned on these pages. Included are the communities of Elko, Wells, Deeth, Jiggs, Lee, Lamoille and Spring Creek. Some geographic features shown are Ruby Valley, Secret Pass, Harrison Pass, the Ruby Marshes (Ruby Lake National Wildlife Refuge), and Lamoille Canyon. Locations of a few other major canyons are shown along with the relative positions of all named lakes in the Ruby Mountains and East Humboldts. To prevent over-crowding, the distances apart for some of the lakes are not exactly to scale. The hikes described in PART 1 to Island Lake and going the other direction to Liberty, Favre, Castle and North Furlong lakes can easily be undertaken without the aid of a map. The driving and hiking instructions to destinations described in PARTS 2, 3 and 5 along with the supplement pages, should be sufficiently explicit but it still might be advisable to obtain wilderness maps. 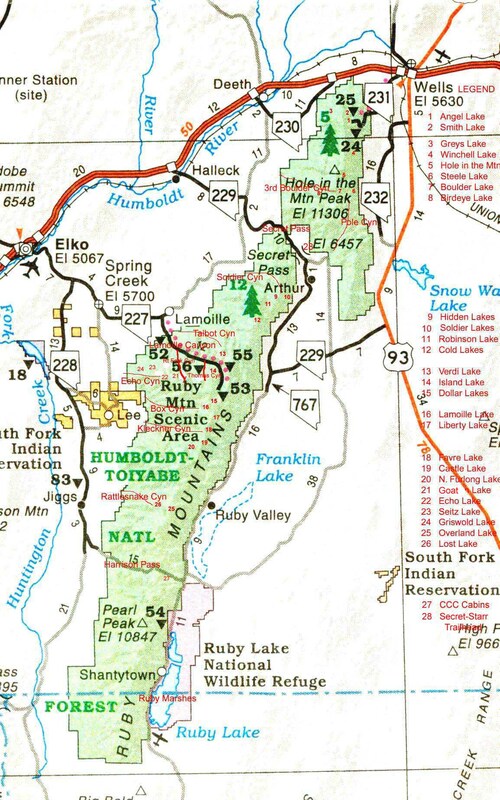 During the week you can purchase separate or combined Ruby Mountains and East Humboldt Wilderness maps from the Humboldt-Toiyabe National Forest office in Elko at 2035 Last Chance Road, (775-738-5171). From Idaho Street, go south on 12th Street until you make a left turn onto the Lamoille highway. Pass Dale White Automotive on the left and Last Chance Road is on the left immediately after passing the dealership. The most popular access to the area is from the trailhead at the end of Lamoille canyon, about a 30 mile drive from Elko. Short hikes over part of the Ruby Crest trail can be made from this location. Avoid excessive snow by planning your hikes at the end of June or later. The elevation at the trailhead is around 8800 feet. 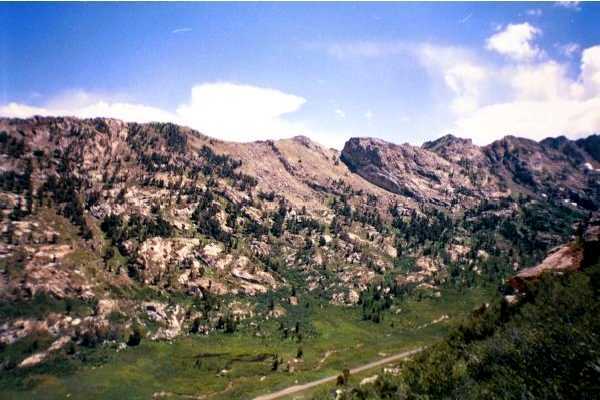 Lamoille Canyon is the large canyon about one-quarter of the distance in from the left edge of the photo. Adjacent canyons to the right are Seitz and Hennen canyons. 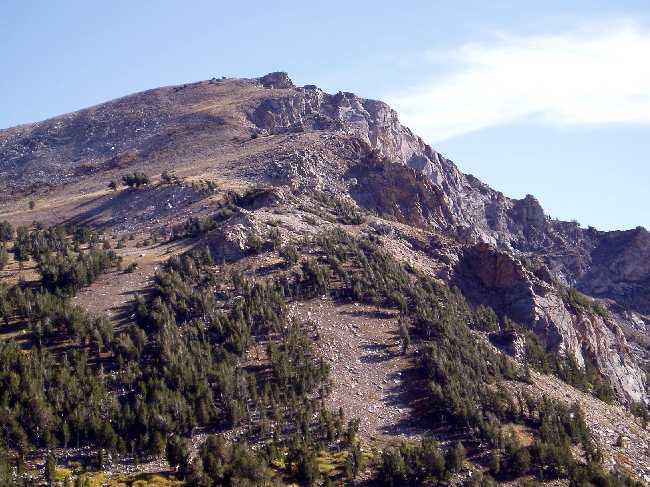 Hennen Canyon is the most common way of accessing Ruby Dome, the highest peak in the Ruby Range at 11,387 feet in elevation, which is the rounded peak to the right of the pyramid looking peak. To reach Lamoille Canyon from Idaho street, the main east-west street through Elko, turn south towards the Ruby Mountains on either 5th or 12th street and make a left turn onto the Lamoille highway (SR227). A couple miles later at the top of Lamoille Summit, the Ruby Mountains will first come into good view. The above photo takes in two or three miles of the central mountain range. A mile or two later, at the intersection of the Lamoille Highway and SR228 (to Lee, Jiggs, Harrison Pass and Ruby Valley), the highway passes through the community of Spring Creek. Observe the 55 MPH speed limit (or 45 MPH "when lights are flashing") when passing through this area. Several miles later the highway will turn left, paralleling the Ruby Mountains. Less than a mile before reaching the rustic community of Lamoille, make a right turn onto the paved Lamoille Canyon road to begin the drive up majestic, glacier carved Lamoille Canyon. 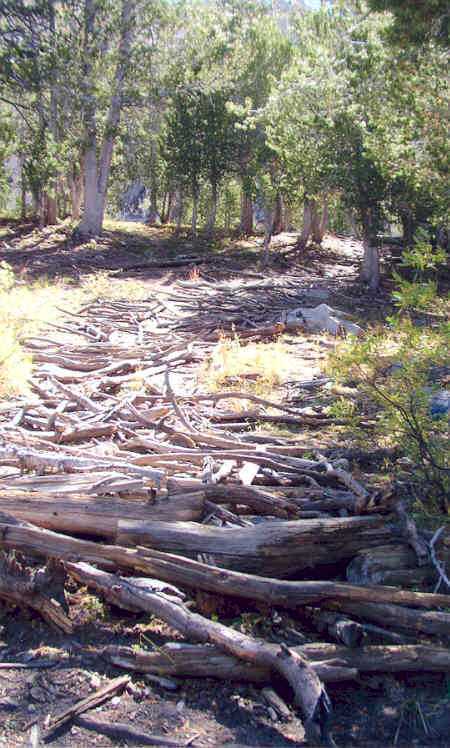 There is usually a Lamoille Canyon Recreation Area sign at the intersection identifying the road to the canyon. It may come as a complete surprise to discover that the Silver and Sagebrush State is not all brown mountains and sagebrush. It is a 12 mile drive from the mouth of Lamoille Canyon to the parking lot at Road's End. 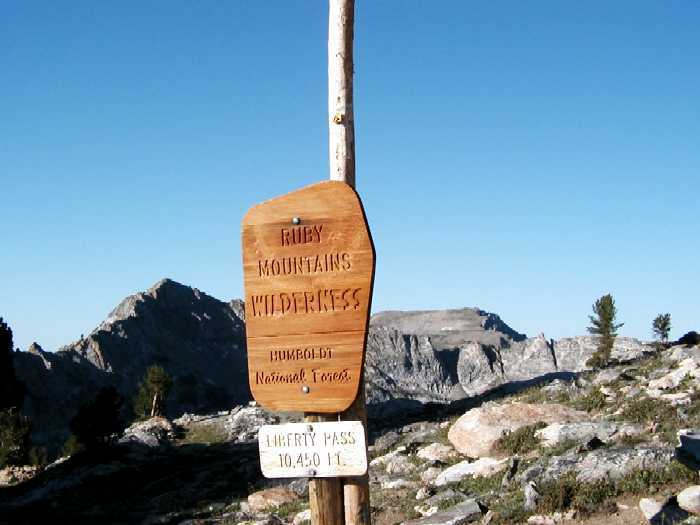 The Trailhead sign at the far end of the parking lot gives the mileage and estimated hiking times along the Ruby Crest Trail to Lamoille Lake (2 miles), Liberty Pass (3 miles), Liberty Lake (4 miles), Favre Lake (5 miles) and N. Furlong Lake (7 miles). The indicated distance to Island Lake, that uses a different trail starting at the entrance end of the parking lot, is 2 miles. 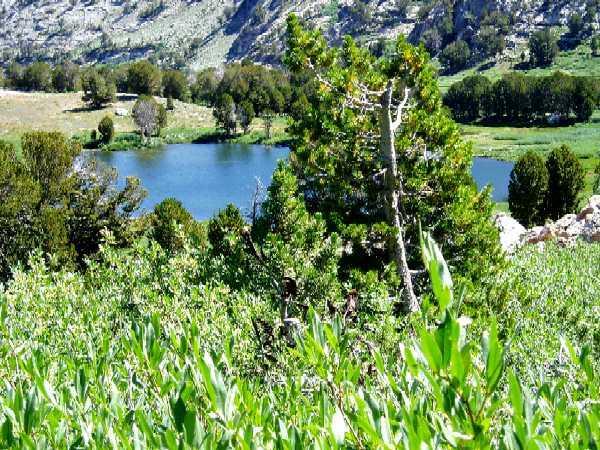 An easy beginning hike from the parking lot at the end of Lamoille Canyon is to Island Lake, a round trip distance of about 3.5 miles. The climb is gradual with switchbacks along the trail, and hiking time to the lake is usually an hour or less. 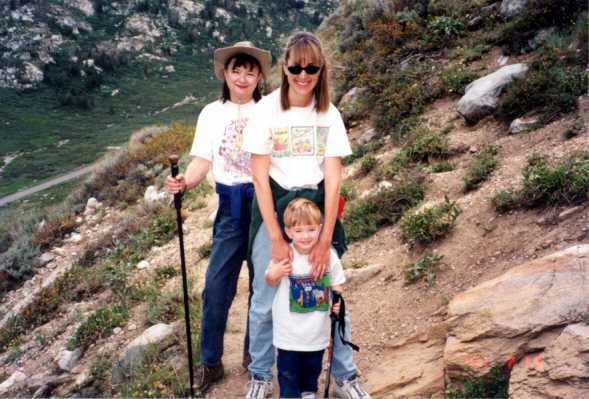 With a little encouragment, younger children should be able to make this hike with little difficulty. The lake sustains a population of Brook trout but fishing is usually not good. Island Lake and cliff photos. Left photo shows cliffs where goats can often be seen. Next photo to the right shows cliffs where snowcocks can be found. 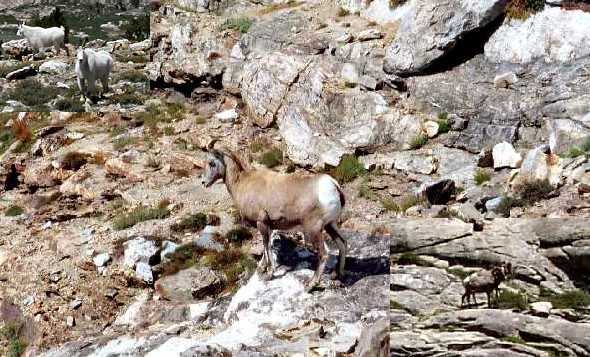 A mountain goat is actually visible, but not recognizable, in the extreme right photo. Expand this photo and find the rock projection that looks like a profile of a face with a flat head. Then find the white spot right where the downward sloping top of the head profile meets the upward sloping cliff. This is a large mountain goat that was plainly visible through binoculars. Himalayan Snowcocks are native to mountain ranges in central Asia. They were introduced into Nevada between 1963 and 1979. The Ruby Mountains and the East Humboldt Range are the only places in the U.S. where Himalyan Snowcocks have become established in the wild. 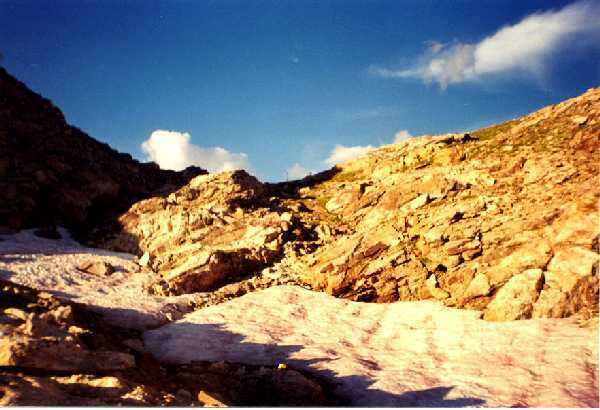 The glacially carved cirque provides typical snowcock habitat. They prefer alpine meadows and open rocky slopes like you see here. Nesting occurs in April and May. Eggs are laid in a scratched hollow on the ground and by June, chicks can be observed with adults. Snowcocks fly down slope early in the day, feeding uphill while clucking and cackling constantly. They remain at high elevation habitat all year, where winter winds keep ridges open. Mountain goats are native to parts of Canada and the northwestern U.S. 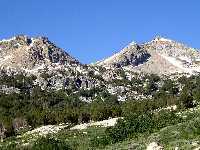 They were introduced into the Ruby Mountains during the 1960's. Mountain goat habitat includes rocky cliffs and ledges, like you can see in the surrounding landscape. Mountain goat hooves are adapted for this rocky habitat. Their hooves have an outer edge that is sharp and a rubbery sole that provides traction. Breeding occurs in late fall, and kids are born in May or June. During the summer, nannies with kids can be found in alpine meadows above 9,500 feet. 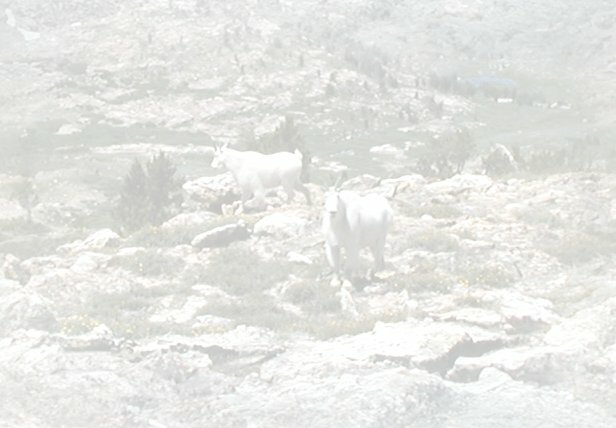 During the winter, the goats prefer rocky areas that shed snow; they can often be seen from the road in Lamoille Canyon. Today, species are introduced into new areas only after careful research. People have learned that sometimes these "aliens" can disrupt the natural balance of native species. But the presence of snowcocks and mountain goats does not appear to have had any detrimental effect on the native plants and animals here. Both these species were introduced as game... [but] today they are more likely to be "hunted" by birders and wildlife photographers. For more information on these species...contact the local office of the Nevada Department of Wildlife. Going the other direction from the parking lot along the Ruby Crest trail towards Lamoille Lake, there are two trails leading to the lake before merging to a single trail that continues up Liberty Pass, a Hiker trail and a Stock trail (for horse traffic). Hikers can use the Stock trail but horses and riders should not use the Hiker trail. 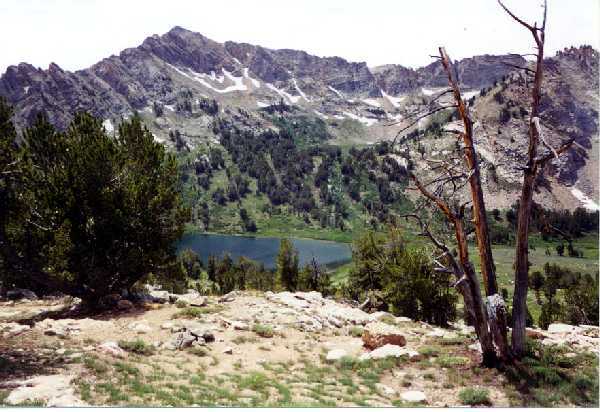 The Hiker trail, the more scenic of the two, starts up the center of the canyon, is in the shade much of the way while threading its way through the pines, crosses Lamoille Creek a couple times, and eventually works its way up the left side of the canyon below the cliffs right before approaching Dollar Lakes and then Lamoille Lake. 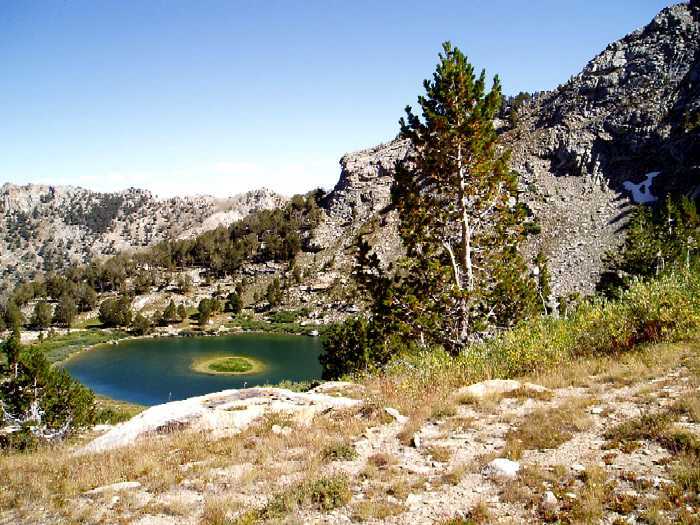 There are no fish in the shallow Dollar Lakes; Lamoille Lake just a little farther up the trail furnishes the first fishing opportunity. 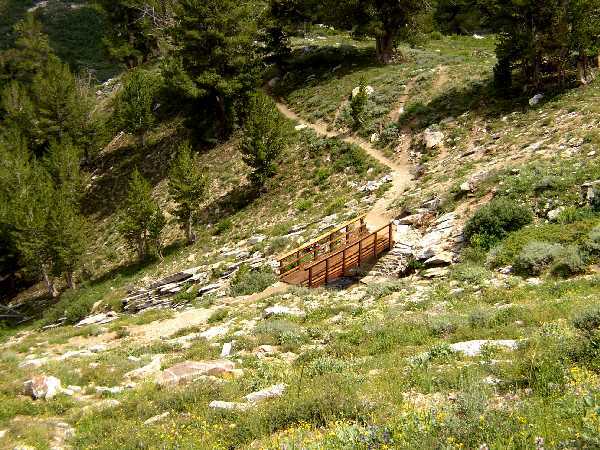 The Stock trail merges with the Hiker trail right before Lamoille Lake. 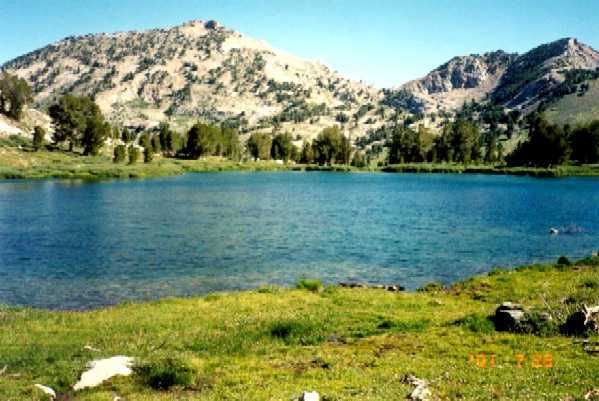 The hiking time to Lamoille Lake from the parking lot can be stretched to two hours at a comfortable, leisurely pace. 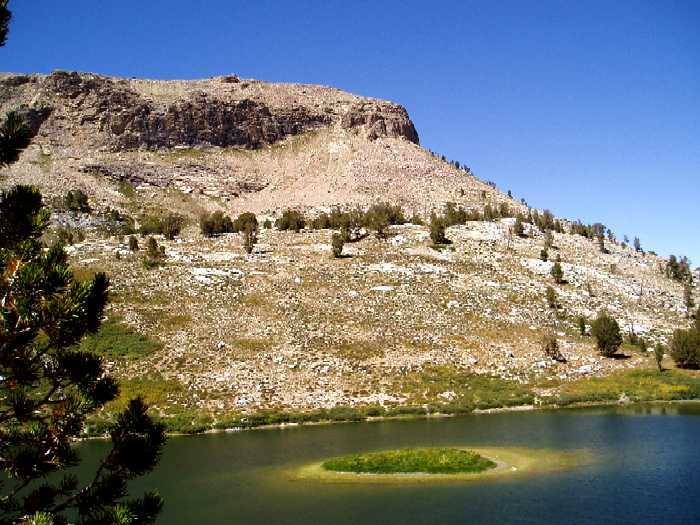 For many day hikers, Lamoille lake is the final destination for the day. The lake is well stocked with Brook trout but fishing is usually not that good. For SUPURB photos of Lamoille Lake and the Lamoille Canyon area, link to web site A Hike in Lamoille Canyon by Abe van Luik. There are numerous switchbacks along the trail and there may be a strong tendency to cut across the switchbacks. There are signs along the way admonishing hikers to stay on the trail and an ingenious way has been devised to discourage switchback cutting. The following photo shows large tree branches placed horizontally between the trail sections that should provide incentive to stay on the main trail (and you never know when trail police might be lurking among the trees). The Stock trail is somewhat shorter than the Hiker trail and starts to gain altitude immediately and proceeds out in the open along the steep wall on the right side of the canyon, again with numerous switchbacks. Other than being a little shorter and providing some diversity from the Hiker trail, about the only other practical reason for taking the Stock trail would be if the destination is the ridge between Lamoille Lake and Box Canyon, and some have used this approach to attempt the difficult off-trail route to Echo Lake, which for many is the most prized destination in the Rubies and one of the most difficult. But the moderately difficult climb just to the ridge is an excellent and unusual destination in itself. For Box Canyon Ridge information, go to Part 2 Supplement and link to the Box Canyon section. The following two paragraphs present just a brief introduction to Echo Lake. Using the route via the ridge, the Stock trail would put the hiker in a better position at a higher elevation to start the off-trail ascent to the ridge overlooking Box Canyon. The sidehilling should be started some distance before Lamoille Lake comes into view. And from the ridge overlooking Box Canyon, it gets more difficult continuing on to Echo Lake through steep and loose terrain. The lake's location is not obvious and this route only gets more difficult. There are at least four very difficult off-trail routes to Echo Lake. 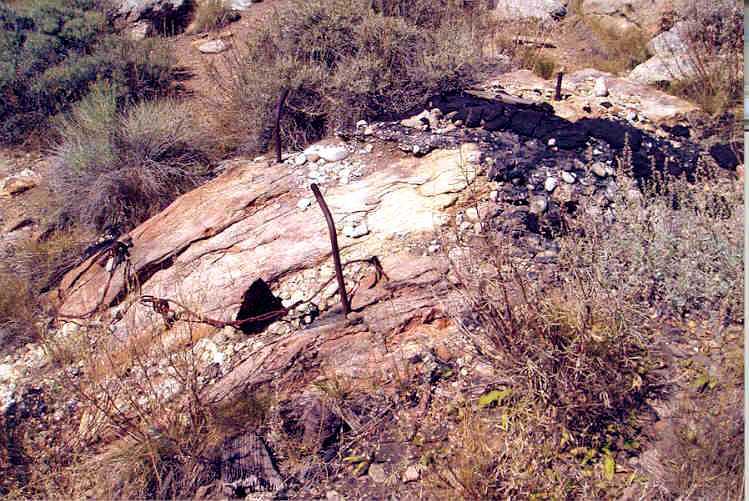 However, there is a fairly easy way that even has a trail but is somewhat complicated due to the necessity of crossing Indian land to Echo Canyon and paying a modest fee. 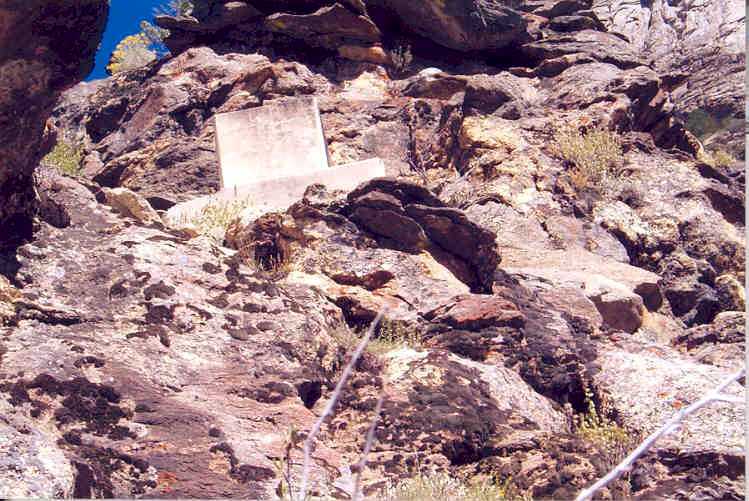 See the Echo Lake section at Part 2 of this site Other Wilderness Areas, Photos and Information for informatiton on arranging access to Echo Canyon through the Indian Travel Office at Lee. 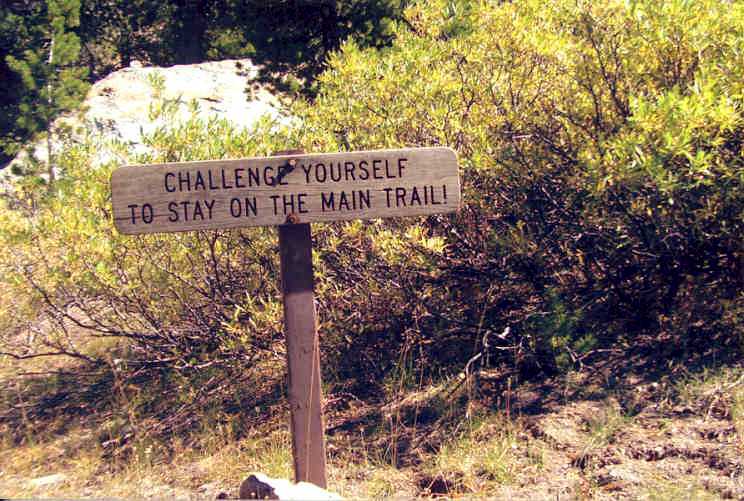 With Echo Canyon available, there is no need to torture yourself with any of the off-trail routes. More information on Echo Lake is available in Part 3 Supplement Outfitters, Pack Trips, Thomas Canyon, Right Fork Canyon and Ruby Valley. The mountains abound with dwarf willow bushes. These thick entanglements are anywhere from one to six or seven feet tall and are prevalent in lush canyons and hillsides, along creeks, and around much of the shoreline of some of the lakes. If you are making an off-trail climb and encounter a large willow patch, try to go around rather than through if it is much over one to two feet in height. Willow patches found around creeks can be over your head, and fighting your way through this is anything but fun. These willow bushes are the ultimate in trip-wire design and unexpected falls are to be expected that could terminate on sharp rocks or several feet down into unseen spring drainages. Hiking shorts might be stylish but they are not at all recommended for off-trail encounters with willow patches and sharp rocks. Knee protection should be a must and this requires heavy duty full length pants with even knee pads underneath. Don't overlook the usefullness of a sturdy trekking pole, or preferably two, especially when taking off-trail climbs up steep and rocky hillsides. The trail from Lamoille Lake continues on up to Liberty Pass. The distance is indicated as one mile, it is moderately steep, but the numerous switchbacks along the trail make it quite manageable. You may encounter some snow along the way and the hiking time shouldn't be much more than 45 minutes. Several times I have been coming back down the pass during late afternoon and have met hikers coming up the pass with the intention of continuing to Liberty Lake to fish and then returning to the parking lot. This could be cutting the time a little close before darkness sets in. Have a flashlight along if this might be you. The Liberty Pass sign near the bottom of the "V" is visible in the above photo. Continuing down the far side of Liberty Pass is a pleasure, and Liberty Lake will come into view after walking a short ways down the trail. You will be high above the lake at this point and if you look off into the distance on the far side of Liberty Lake you can see Castle Lake hidden away in its basin. Castle Lake is above Favre Lake but Favre will not come into view until you start to descend from Liberty towards Favre. The trail from the pass will make its way around to the far side of Liberty Lake where you can set up camp near a large rock. Fishing for Brook trout is usually good. The lake also contains some large Mackinaw lake trout but catching one is a rarity. The fish in Liberty are under a sheet of ice longer than most lakes during the winter and, with little food available, it is not very sporting to fish the lake early in the season. The fish are starved and extremely thin with the result that their heads are disproportunately large. At this stage they will bite at anything so try your fishing skills towards the end of July or later after they have put on some weight. 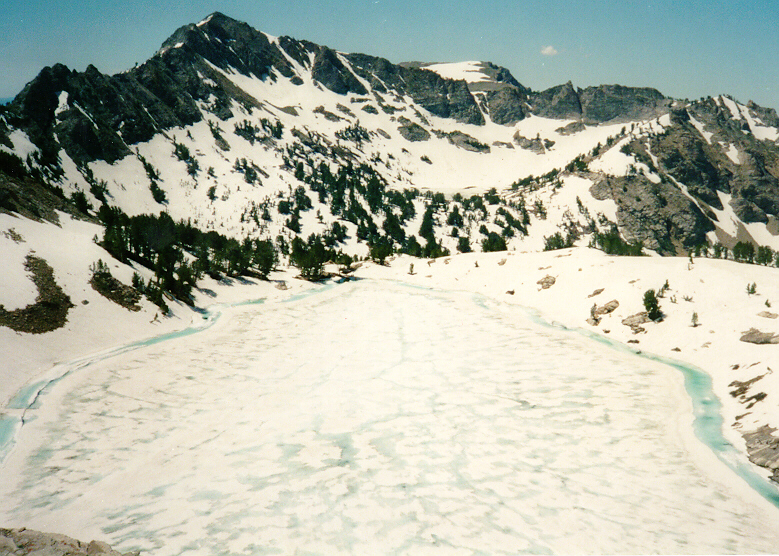 For an unusual July view of Liberty Lake with the ice just starting to thaw around the edges, see photo Ice Covered Liberty Lake During July 1995. Lake Peak is the highest peak to the left of center and the partially snow covered mountain just to the right of center in the background is Wines Peak. And the same view a month later: Liberty Lake as you Would Usually See it During July. Castle Lake can be seen in the basin right below Wines Peak. The above two images are from the National Weather Service Elko, NV photo gallery web page. "Liberty is the quintessential [classic] mountain lake, with splendid scenery and great views. Cradled in a steep-walled rock basin, perched high above the surrounding canyon, you can appreciate the relative popularity of this lake. Travelers along Interstate 80, a mere thirty miles away, race past the range completely unaware of this tremendous beauty, assuming that Nevada is nothing more than endless sagebrush and brown mountains." On a few occasions we packed a five man rubber life boat complete with oars and a large inflation pump to Liberty Lake. Rolled tightly enough, the boat would just fit into a steel frame WWII army knapsack. Trolling Liberty Lake with colorful metalic spoons was very productive and resulted in catching larger fish than what you would normally catch from the shore (but the elusive 10 lb Mackinaw lake trout remained elusive). Favre Lake has Brook trout and fishing at Favre is almost always good. During early season Favre is usually completely thawed while Liberty is still frozen over. By following the more obvious trail from Liberty Lake to Favre, the trail cuts back to the right and makes one long switchback which makes the distance seem a little long. You could make an off-trail beeline from Liberty straight down to Favre by fighting patches of willows, which is the way we used to do it before we knew that the trail actually went down there. At this stage of the hike, the round trip distance from the trailhead is about 10 miles. At altitude on a lazy, warm afternoon you probably won't feel like going much farther. But as long as you're there, take a short but steep climb from Favre Lake up to Castle Lake. Not many hikers actually do this. There is no trail but the way up is obvious. Castle Lake is unusual since it is very shallow, not more than three to five feet deep all the way across. There are no fish in the lake which may almost turn into a solid block of ice in the winter. However, if you know ahead of time that you want to make it to Castle Lake, do not follow the more obvious trail to the right from the sign post near Liberty which will take you down to the right end of Favre Lake. From that point there is little choice other than making the fairly steep and hard climb to Castle. Instead, another trail continues from Liberty Lake which will skirt the left end of Favre Lake and will continue about half way up to Castle. From there it is a much easier climb the rest of the way to Castle. If you intend to camp for several nights, there are better and more private camping areas at Castle Lake than there are at either Liberty or Favre. To find this trail around the left end of Favre, continue on the main trail to Liberty like you were going to the camping area near the large rock, and, 50 yards or so before the camping area, watch for a trail leading off to the right. Actually there will be two parallel trails separated by only a few feet. Take the trail on the right and you are on your way. If you just want to go to Favre only, it doesn't matter which of the two trails to take; they are both easy and about the same length. The hike to Favre, and to Castle if inclined, is usually the upper limit for a day hike or fishing trip. For best fishing results, get an early start. With a full moon on a clear night, you can easily follow the trail without the aid of a flashlight. On one trip we started at 3:00 a.m. with flashlights and extra batteries and were at Liberty Pass by 6:00 a.m. The only reason we can say that we were the fastest hikers on the trail on this hike is because there was no one else on the trail at that hour. Otherwise, three hours to Liberty Pass is certainly not a particularly good time. Usually the pass can be reached in just a little over two hours. However, when hiking during daylight, take time for some good photography along the way rather than trying for a record breaking hiking performance to the pass. If you are camping overnight at Liberty, Favre or Castle, or having started hiking at 3:00 a.m. and just want to extend your day hike, the next and last lake in the vicinity is the mystic sounding North Furlong. Looking up from Favre Lake to Castle, North Furlong is some distance beyond the rugged looking peaks behind Castle. Continue on the trail from Favre Lake as it crosses Kleckner Canyon creek draining Favre and works its way around to the small canyon on the left. The hiking is easy for a ways before coming to a steep but low pass with numerous switchbacks. From here, start looking for Bighorn Sheep and Mountain Goats. After scaling the pass, Wines Peak will be up ahead and the off-trail scramble to Lake Peak will be ahead and up to the left. (See Part 5 of this site Birdeye Lake, Lake Peak, Smith Lake, Clover Valley and Cave Creek for Lake Peak information.) The trail levels out and a short distance later a trail leading down to North Furlong Lake will branch off to the right of the main trail. It is then about a half mile down to the lake. The extra distance from Favre to North Furlong will add an additional four moderate hiking miles to the round trip. This unusual lake, which may seem out of place, does not contain fish. North Furlong is the last lake in this cluster of lakes. The hike to Liberty and Favre lakes is a great experience, especially for the first time, and the scenery is superb. The hike takes you up Liberty Pass and then down to the lakes. After relaxing or fishing at Favre, you may not be looking forward to the uphill two mile portion of the return trip to Liberty Pass. But it is all downhill from there and when you return to the parking lot you can impress the non-hikers by pointing back to that big "V" in the mountain and telling them you were on the far side of Liberty Pass. Returning to the parking lot from Liberty Lake. 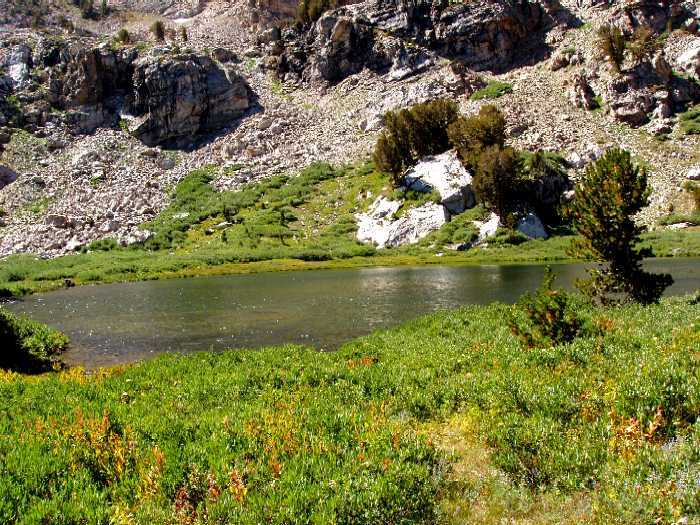 When people say they have been to the Ruby lakes, they are usually referring to Lamoille, Liberty and Favre lakes, the most popular and well known lakes in the mountain range. 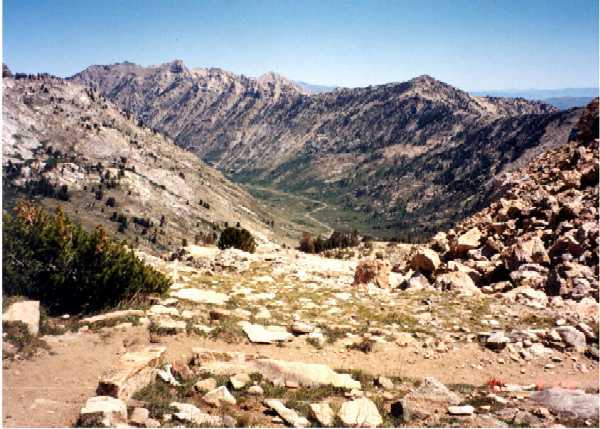 The Ruby Crest trail, also called the Harrison-Lamoille trail, runs between Lamoille Canyon and Harrison Pass near the southern part of the Ruby range, passing by or close to the above mentioned Dollar, Lamoille, Liberty, Favre, Castle and North Furlong lakes during the first seven miles. Beyond North Furlong Lake, the trail passes only one additional lake, Overland, that is about 15 miles from North Furlong. 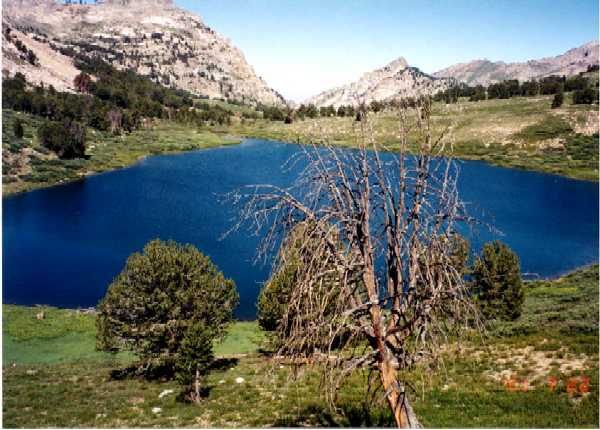 Starting from Lamoille Canyon, Overland Lake is about two or three miles passed the half way point of the 42 mile trail. The crow flying distance for the trail is about 20 miles but the distance for those who have to follow all the turns and switchbacks along the trail is over twice that. GPS measurements indicate the distance from Harrison Pass to Lamoille Canyon as 42 miles. By driving up the 4-WD trail access road from Harrison Pass as far as the road will go, the hiking distance is reduced to about 38 miles. 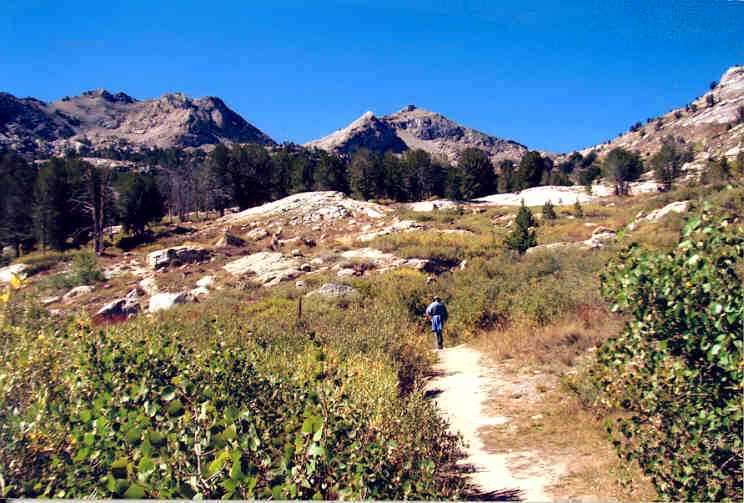 The hike can be made from either direction but the most popular way is from Harrison Pass to Lamoille Canyon. This way, you will descend into "civilization" at the parking lot, and an abundance of water will be available at the latter stages of the trip. Water is unavailable for the first six miles starting from Harrison Pass, and again for about 12 miles between Overland Creek Basin and North Furlong Lake. But by pushing ahead another 1.5 downhill miles, rather than taking the detour down to North Furlong Lake, convenient water will be available at Kleckner Creek draining Favre Lake. Either way, you will first have to spot a vehicle for your return trip at the end (or have someone pick you up), and someone will then have to drop you off at the beginning. It is safer to have a vehicle spotted at the Lamoille Canyon parking lot rather than at the more remote Harrison Pass area. When starting the hike at Harrison Pass, a vehicle can travel some distance up the access road/trail which will dispose of some initial dry and dusty hiking. During August 2004, Robert Johnson, U.S. Forest Service office at Wells, starting at 4:00am completed the entire 42 mile hike in about 15 hours. Typically most hikers spend three nights along the trail. Starting from Harrison Pass, the first night is usually around the McCucheon Creek area, the second night at Overland Lake, and the third night at either North Furlong or Favre Lake. 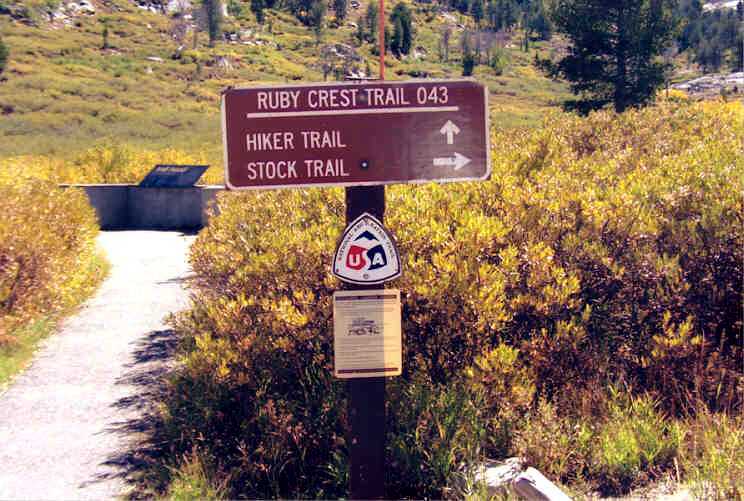 For additional information on hiking the Ruby Crest trail, see Web site Hiking the Entire Ruby Mountains Crest Trail. 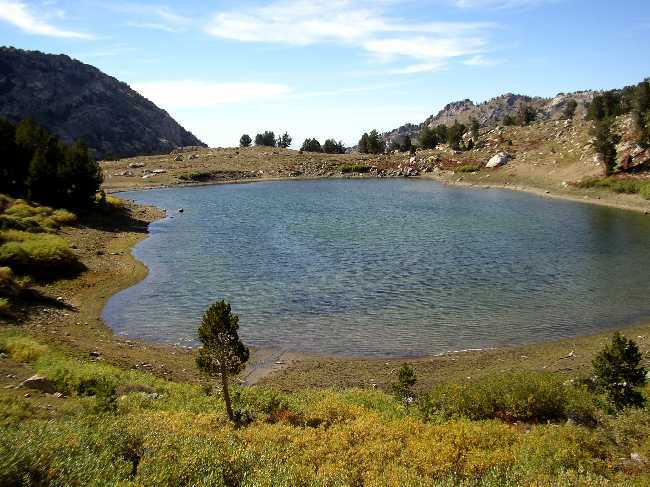 Part 5 of this site, Birdeye Lake, Overland Lake, Lake Peak, Smith Lake, Clover Valley and Cave Creek describes an abbreviated Ruby Crest Trail hike starting from Lamoille Canyon, continuing to Overland Lake, but then descending to the Overland Lake trailhead in Ruby Valley. This reduces the distance from 42 miles to 30 miles. 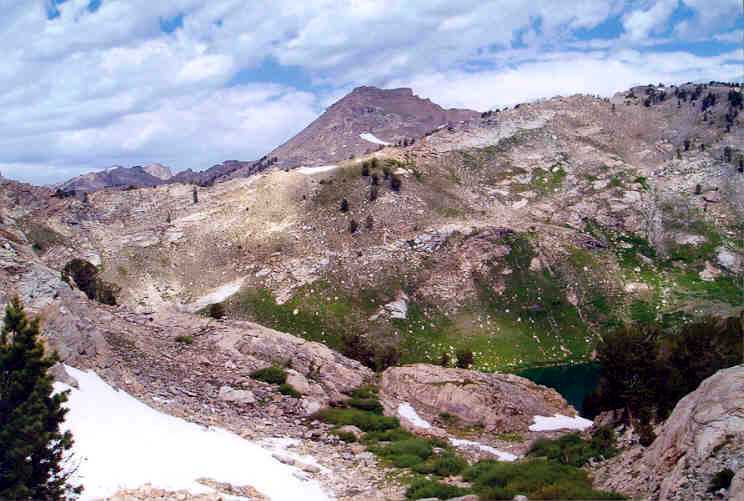 Before undertaking the trail hike, consider acquiring the combined Ruby Mountains Wilderness and East Humboldt Wilderness map (or just the separate Ruby Mountains Wilderness map) from the Humboldt-Toiyabe National Forest office in Elko. Cost of the combined map had been $4 and the map can be sent to you by calling the forest service office at 775-738-5171. There aren't many side trails leading off the main trail, but the map could help prevent making a wrong detour along the way. Four by four posts, however, are usually at trail intersections that will define the trail. 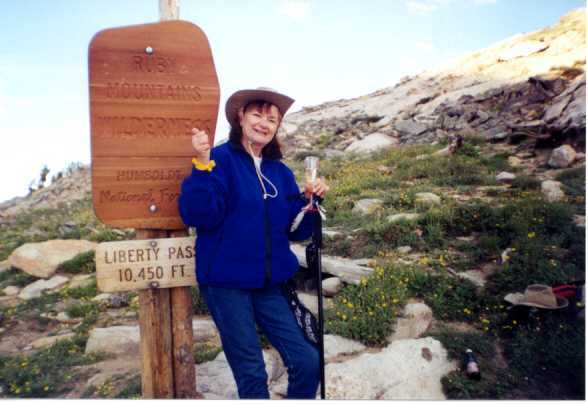 For an inspiring account of conquering the Trail, requiring considerable effort and determination and accompanied by agony and suffering, Hiking the Ruby Crest Trail with Lynda Mellows and Rosanne Baker is a Must Read. Lynda Mellows is 40 years of age and her mother Rosanne Baker is 64 years of age. If they can do it, you and I should be able to do it also. Well...maybe. They hiked from Lamoille Canyon to Harrison Pass which I consider to be the hard way. By going the other direction, you will get the long, dry, loneliest stretch out of the way first while you are still fresh, and there will be plenty of water available down the home stretch. Other hikers will be encountered during the last seven miles or so which will provide the relief of finally "getting out of the woods". Author Lynda Mellows' vivid description let's you experience almost first hand the agony and glory of conquering the trail. Undecided trail hikers will quickly come to one of two conclusions: 1) 'I can't wait to get started', or 2) 'For now I'll just be satisfied with a hike to Island Lake'. A powerhouse for the Elko-Lamoille Power Company had been constructed around 1913 at the entrance to Lamoille Canyon to supply electricity to Elko and Lamoille. It burned down during 1971, leaving only the concrete foundation. The powerhouse was located alongside Lamoille Creek but water pressure at that point was not strong enough to power the turbines. 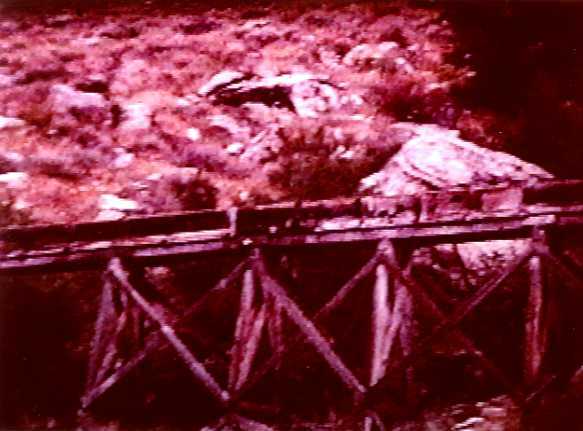 Some three miles up the canyon, water from Lamoille creek was diverted to a flume that carried water down the canyon to the powerhouse, and gravity flow reaching 180 MPH solved the power problem. The most visible part of the flume was in the lower part of the canyon and was built some distance up the hillside on the left as you were traveling up the canyon. Much of the flume was built across trellises spanning the vertical ridges projecting down the canyon wall. Part of the flume consisted of iron piping some 12" in diameter that was enclosed within a wooden frame on three sides with the top left open, while other sections of pipe were only supported on the bottom with no frame enclosure whatsoever. Other parts of the flume consisted of just the solid wooden frame without piping, and it was common to see water leaking, sometimes pouring, from these wooden sections. It naturally followed that walking the flume became a popular activity. 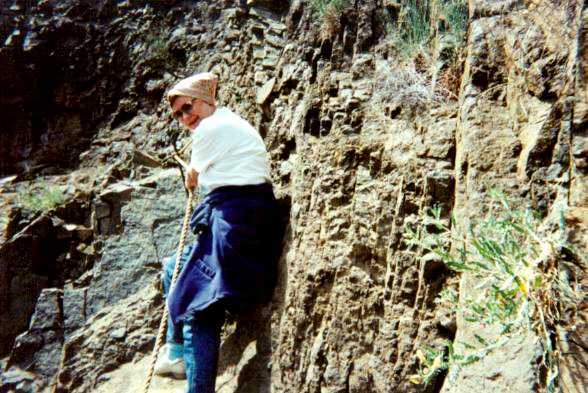 It was easy to do, especially where the frame completely surrounded the pipe or flow of water, but you couldn't really call it a hike. However, over sections of pipe that were not covered on top, walking had to be done on the curved iron pipe. Some of the trellises were rather high off the ground and care had to be exercised when traversing those sections that were open. I'm not aware of anyone who fell and was injured but the possibility of falling was an accepted risk. These flume walkers are on a stretch of open pipe (top photo) with no framing on the top or sides. The trellises added an unusual and interesting feature to the canyon wall, but the flume has now been disassembled and only parts of the wooden framing and hardware can be found along the hillside. The picnic grounds located close to the powerhouse retain the Powerhouse name. Miscellaneous planking, cables and cement block foundations can be found some distance up the hillside. On one side excursion, hoping (unrealisticly) to find an undiscovered lake on the other side, I climbed the ridge directly to the left of the Lamoille Canyon parking lot. The above photo, taken from the Island Lake trail, shows the canyon wall and ridge in full view. The parking lot is out of view to the lower right. The first part of the climb was easy enough, but the second part was through the treeless, beige colored terrain near the center of the photo which is loose rock and shale. The best way to traverse this turned out to be on all fours, hand over foot. Scaling the ridge near the low point of the saddle, the ridge was only inches wide, and it was difficult to safely traverse the ridge line for more than several feet in either direction. Your left foot is on the left side of the ridge and your right foot is on the right side. The drop off on the far side was steep enough to discourage any thoughts of descending into the adjoining canyon. You are actually looking out at Ruby Valley from this viewpoint, but if there would have been a lake down there, it would have just had to have stayed there by itself. Lake fishing is open year around, 24 hours a day. Lake fishing is unpredictable but chances are greatly improved by being there early. Early refers to both early in the season, June or July, and early in the morning (or early evening). The best fishing lakes, considering fish quality, are Boulder and Steele in the East Humboldt range and these are early morning lakes at the extreme. They are also difficult to get to. At Boulder, great fishing from the first signs of daybreak may last for only an hour and then abruptly end until evening. The fish at Steele Lake are more cooperative and will continue to hit for a while longer. The predominate fish in most lakes are Brook trout with colorful markings. They are often on the small side, ranging from seven to ten inches. The notable exceptions for Brooks are at Boulder and Steele lakes, with sizes extending to 12 inches, and these "Clydesdales" are proportionally heavier than usual. The next most common species is Cutthroats and these can be quite large, up to 18 inches in length. Hidden Lakes, Smith Lake and Greys Lake are good Cutthroat lakes. Other trout species that might be encountered are Rainbow, Golden, Mackinaw and Tiger. Tigers, sometimes found in Angel Lake, are a hybrid of female Brown and male Brook, but normally cannot reproduce. Tiger trout have tiger like markings, are more ferocious than either of their parents, and have been know to reach 20 inches in length. Lake trout (Mackinaws) are known to exist in only two lakes, Echo and Liberty, the two largest and deepest lakes in the range. They can be well over 20 inches in length and up to 10 pounds. I have seen Mackinaws in both Echo and Liberty lakes but have never caught one. Attempts have been made to stock Golden trout in Cold lakes but they failed to survive. Smith Lake is also to have been stocked with Goldens, but fishing reports on this lake are so sketchy that their survival status is unknown. Some insight into a lake’s fishing potential is included with the hiking information for that lake. But in each case, timing is important. Echo Lake for example, due to its inaccessibility, generally provides superb fishing but during an August heat wave you may hardly catch a thing. Several lakes are small in size, three to five acres or less, and these can be great fishing. Severe winters, however, can be unforgiving on small lakes and winterkill may almost wipe out the entire population. Small or shallow lakes that usually or always have fish are Greys, Smith, Robinson, Hidden and possibly Winchell. Other small or very shallow lakes that do not have fish are Birdeye, Dollar, Castle and Seitz. The following chart, with the exception of the elevation figures shown in parenthesis and brackets, is reproduced from a similar chart prepared by the U.S. Forest Service that had been available as a web page. Winchell 8200 (8625)  6 ? ? The initial elevation figures are those previously shown by the U.S. Forest Service table. The elevation figures in parenthesis are those that are available from GNIS--USGS Geographic Names Information System. In most cases the U.S. Forest Service elevations are rounded to the nearest hundred feet from the GNIS elevations. The elevation figures shown in brackets are derived approximations from Google Earth Mapping that uses GPS satellite imagery. Google Earth can be downloaded from Google Earth Download. Using Google Earth is kind of a guessing process (just where exactly do you place the mouse pointer for the most accurate reading?) but most of the GNIS and Google Earth figures do compare favorably. The USFS elevations for Liberty, Winchell and Overland lakes show 300 to 400 foot differences from the GNIS and Google Mapping figures. 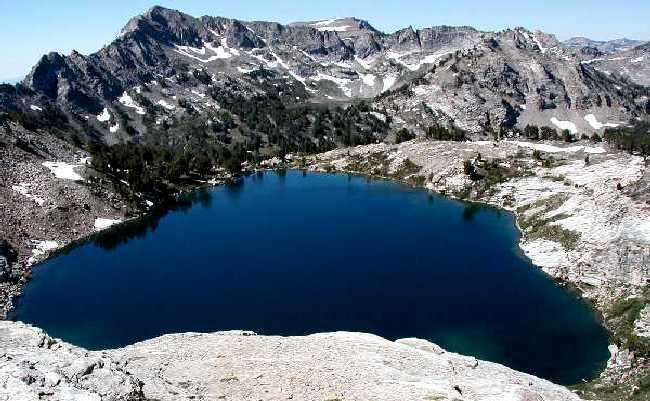 Considering Favre Lake at 9500, it seems more likely that Liberty Lake would be closer to the 10,000 foot figure rather than the USFS 9700 foot figure. Be aware of the possibility of wet weather. Drenching downpours can occur when least expected, but sometimes they pass over as quickly as they appear. Especially during July, mid to late afternoon showers and heavy rain moving throughout various parts of the mountains can occur almost on a daily basis. 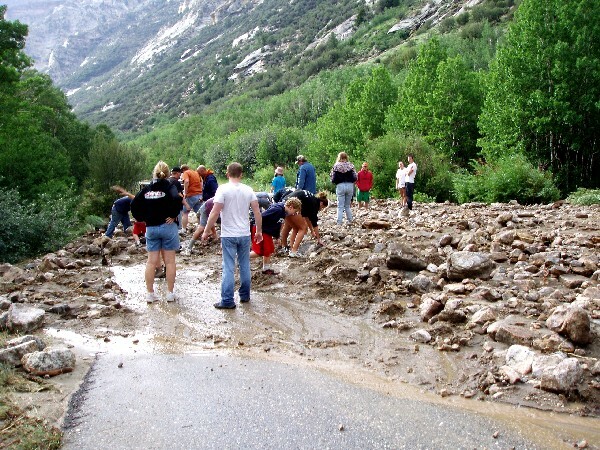 During late July 2006, showers started about 3:00pm at Lamoille Lake and hikers were drenched all the way back to the parking lot. During the hike down, considerable lightning could be seen further down Lamoille Canyon, indicating heavier than usual rainfall. 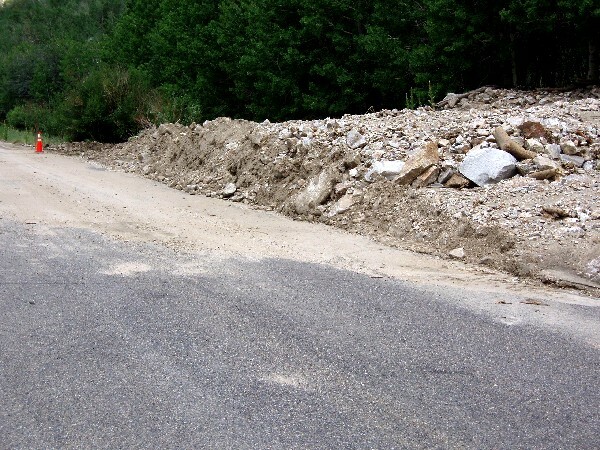 This rain resulted in two rockslides that closed the road between the parking lot and Thomas Canyon. It was a Saturday so there were more hikers than usual in the canyon and no one especially wanted to spend the night at the parking lot. So with about 50 able bodied men, women and kids throwing and rolling rocks (or just standing around), in about an hour we were able to clear enough of a path through the lower end of the two sldes to allow all vehicles to pass through. Road equipment didn't arrive in the area until the following day to completely open the road. The gorge in the right photo, the origin of the rock slide, is located right acrosss the road from the Nature Trail. Late night and pre-dawn temperatures during July and August can be in the 30's and 40's at the higher elevations. Hiking conditions will generally be more on the warm side than on the cool side. A light or medium jacket is usually necessary for a pre-dawn or early morning start, but it won't be long until the jacket is relegated to the knapsack or tied around the waist. Creek runoff during June and July is high, making it necessary to wade many of the creek crossings. 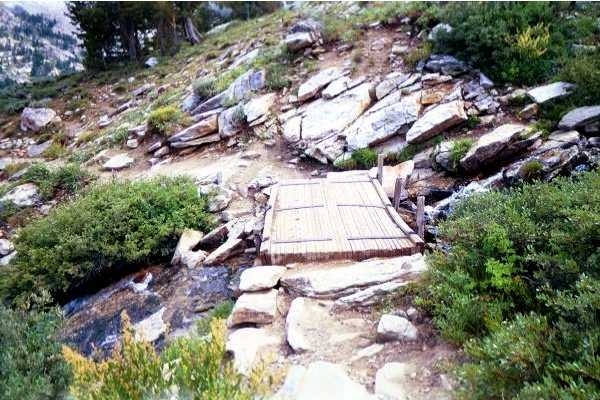 The exceptions are the crossings on the way to Lamoille Lake where foot bridges have been constructed. What to wear? Hiking shorts seem to be taking over the Ruby Crest trail but they just seem out of place. This trail, however, is a good, wide open trail but shorts are certainly not recommended for other more rugged trails like Soldier Canyon or any off trail hiking and climbing. Bring your dogs along if they want to come; there are no dog restrictions. They will have a lot of fun chasing ground squirrels (that they won't catch) but if their feet are not conditioned to long trail walking and running, the pads of their feet could come loose. Have some emergency "dog socks" available. Several different berries might be encountered along the way. If you can recognize currants or chokecherries, these are OK to eat. But if in doubt, DON'T. Some berries are poisonous and sampling some could ruin the whole day. 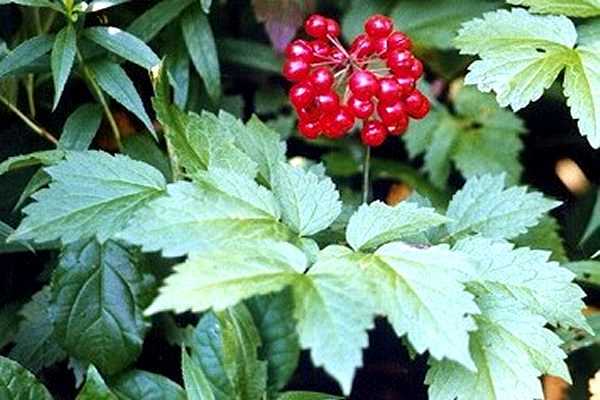 The baneberry is an extremely poisonous berry that is dark red and grows in clusters at the end of the stem. Eating just a few could at least result in stomach cramps and vomiting. The individual berry stems protrude at a rather distinctive 90 degree angle from the main stem. Firewood in the mountains is generally scarce. You may come across a downed, dried-up tree, but firewood is otherwise limited to just small pieces of tree limbs scattered here and there. A camp stove or small backpacking stove is the only reliable means for heating and cooking. Fishing licenses can be obtained from several sources in Elko. One convenient location is the Sav-On-Drug store located near the west end of town at 550 W. Idaho Street (near the junction of the Mountain City highway). The fee for out-of-state licenses is $12 for one day and an additional $4 for each consecutive day thereafter. When making day trips, getting to a lake or other destination is only half the battle, and, if you do not have flashlights, you also have to get back while it's still daylight. If necessary, turn back without reaching your destination and get an earlier start next time. A rescue due to injury or getting lost would be very embarrassing, uncomfortable and could even be costly. Violent and unseasonal storms can hit the mountains. 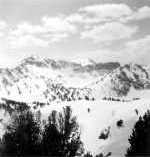 Thomas Canyon, a fork off Lamoille Canyon that is mentioned several times throughout these pages, is named after Raymond Thomas, a former Elko school teacher, who died in 1916 after he and other hikers were caught in a sudden October snowstorm. 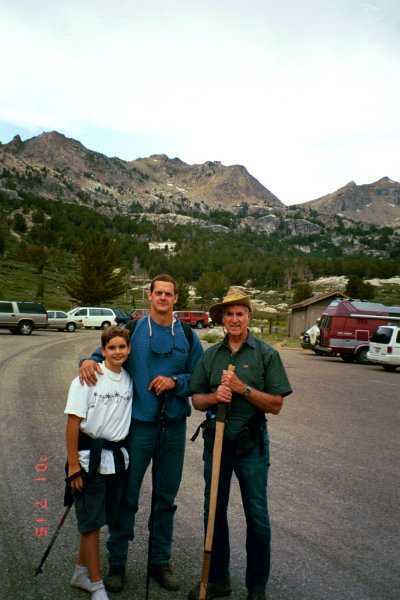 In a much more recent tragedy, during March 2001 a 22 year old man from Twin Falls, Idaho and his nine year old half-sister from Elko died after falling 60 feet from a ledge in Lamoille Canyon. 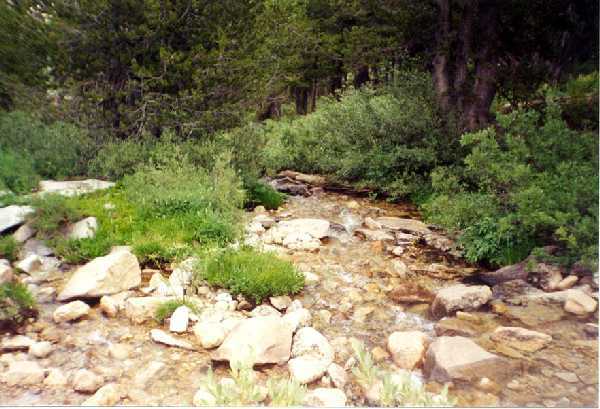 The location was near the branch to Right Fork Canyon. The report indicates that they had taken a shortcut over some bluffs and fell as a result of slipping on snow. 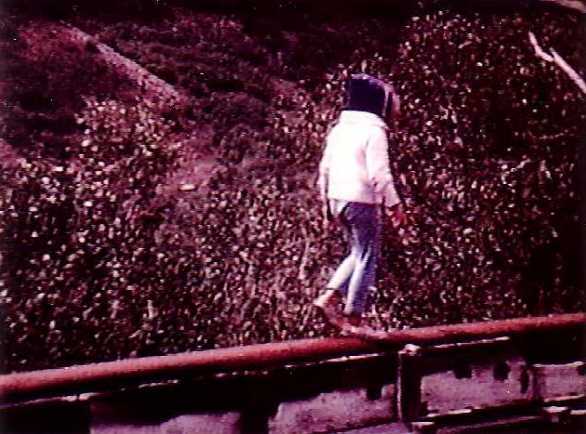 A newspaper article dated May 31, 2004 states that an eleven year girl from Sparks, Nevada died in the Ruby Mountains after apparently falling some 75 feet down a cliff. It was not mentioned if snow was present that could have contributed to the fall, but she and her party had been camping at the Thomas Canyon Campground and there still could have been patches of snow in that area. The mountains hardly have a dangerous reputation but unreported non-fatal incidents close to the ones described above probably occur with some frequency due to carelessness, not being properly equipped, or overestimating one's ability. Others, like the following, are less predictable. A snowmobiler at Lamoille Lake was caught in a mild avalanche which swept the snowmobile and driver onto the frozen lake, breaking through the ice, and neither was recovered until the following summer. 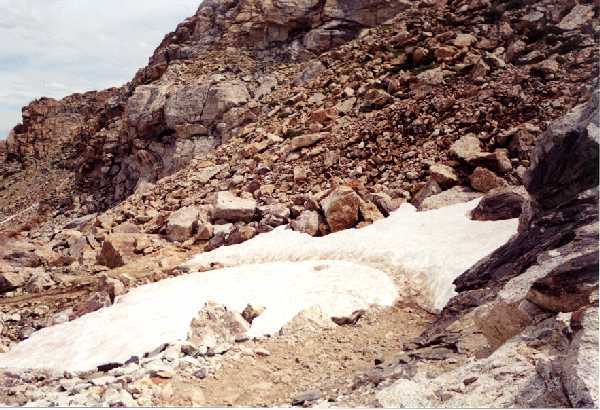 Snow still abounds until June or July and many off-trail areas can be dangerous without snow. Play it smart and avoid becomming a statistic by paying attention to and respecting the elements. From the Thomas Canyon campground, the Lamoille Canyon road extends four more miles up the canyon to the parking lot at road's end. During early June, unless the last quarter to half mile of road has been plowed, it is not always possible to drive all the way to the parking lot. And from road's end there are still several feet of snow farther up the canyon that makes the trail to Lamoille Lake impossible to follow. 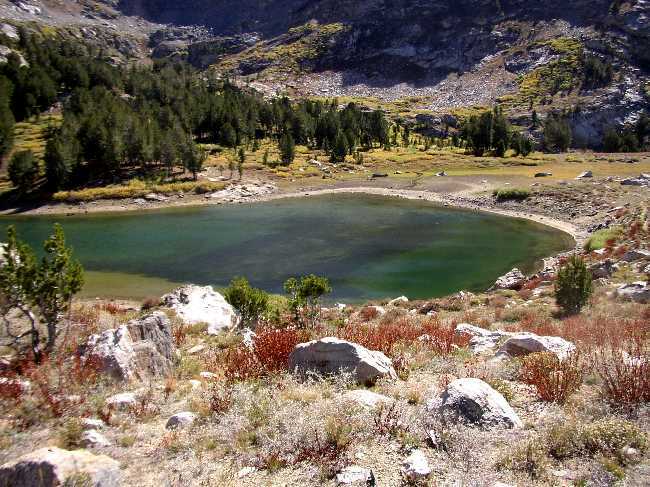 As an alternate hike, the snow is usually gone from the trail to Island Lake that begins from the parking lot but extends in the opposite direction from the trail to Lamoille Lake. Other early season hikes are Thomas Canyon from the campground and Right Fork Canyon a few miles back down the road. See Part 3 Supplement Outfitters, Pack Trips, Thomas Canyon, Right Fork Canyon and Ruby Valley for Thomas Canyon and Right Fork Canyon hiking information. When considering a trip during late May or early June, call the U.S. Forest Service office at 1-775-752-3357 for snow and road conditions, or link to Ruby Mountains Road and Snow Report that usually contains updated road conditions in the canyon. But just because the road is open doesn't mean that the trail is open. 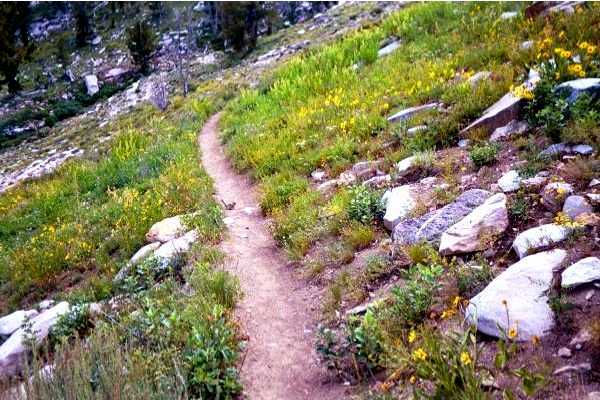 By early July most of the snow has melted and the trail is open to Lamoille Lake and on up to Liberty Pass and over. On one trip we did go to Favre Lake on June 1st. We were able to drive up Lamoille Canyon to the parking lot, but there was the usual early season snow from there on in to Lamoille Lake and beyond. The trail was completely hidden so the only alternative was just to pick your way through the rocks, snow and brush the best you could. 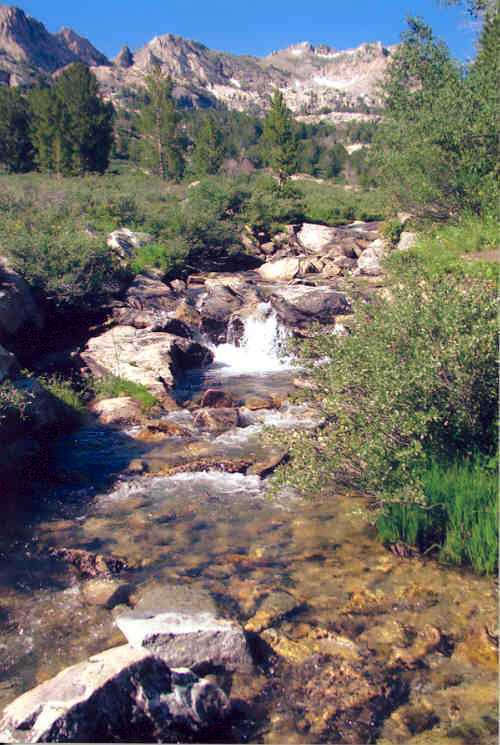 By staying high and to the right of Lamoille Creek, you can avoid much of the ever-present thick brush and willows that will only be partially covered with snow and difficult to traverse. We wore hip boots to make our way through the one to two feet of slushy snow to Lamoille Lake. When approaching the lake using this route it is necessary to wade Lamoille Creek on the left. Going up Liberty Pass was not too difficult. There was snow about all the way but you could follow the trail reasonably well. Much of the snow on the other side of the pass was gone and it was easy to find a dry spot above Liberty Lake to spend the night. Liberty Lake was completely frozen over. Favre Lake was clear except for some snow banks around the edges, and the fish were in good condition and fishing was exceptional. On another occasion in April, we were able to drive up Lamoille Canyon almost to the Thomas Canyon campgrounds before snow blocked the road. 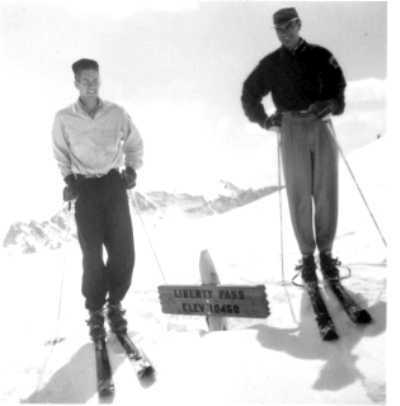 We then donned skis with moleskins and trudged our way up to Lamoille Lake, again staying high and to the right of Lamoille creek when passing the snow covered parking lot. This added five miles to the one-way trip but the going was easier than the June trip since the snow was hard packed and deep which covered most of the brush. Approaching Lamoille Lake and wearing skis, we crossed Lamoille Creek on a snow bridge without caving in. 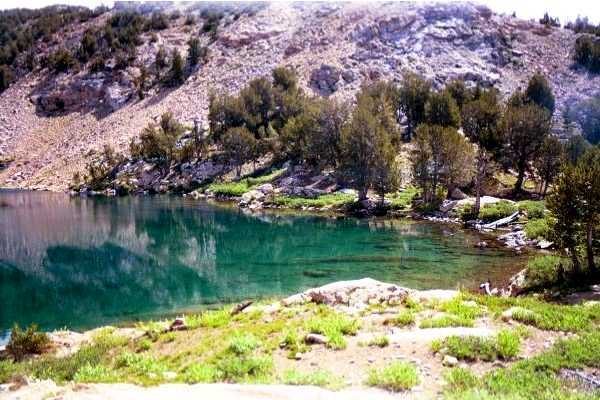 This was a two night outing and it was our original intention to stop at Lamoille Lake. However, Liberty Pass didn't look impossible, except on skis, so we threw the skis over our shoulders and started through the snow to the pass on foot, but put the skis back on towards the top where it made the going easier. Getting to the pass required considerable effort and there was some concern that once we got there the Liberty Pass sign would be buried under the snow. We could follow the trail switchbacks during the lower portion of the climb, but after that there was little choice other than pointing the skis straight upward in a beeline direction towards the top. The moleskins on the bottom of the skis prevented back-sliding. Rattlesnakes are residents of the area (very prevalent in Ruby Valley) but I have only seen one in Lamoille Canyon. During mid-day a large rattler was shading himself beneath a sagebrush on the hillside to the left of the powerhouse right after entering the canyon. It is not likely that you will encounter one, but they rate the usual precaution--don't reach anywhere you can't see. The most likely area to find one is around the Powerhouse Picnic Grounds. There are some friendly porcupines. It is more likely that a chance meeting with one would occur at night rather than during the day since they seem to prefer the coolness of the evening. 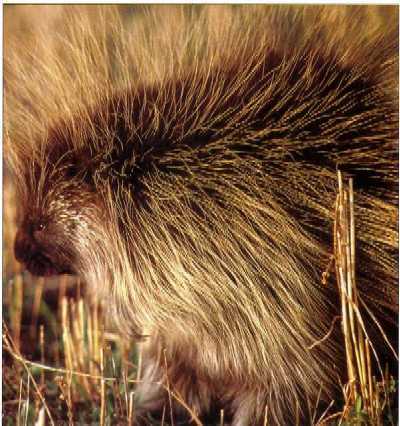 Porcupines are generally in no hurry to get somewhere, but they can run quite fast if need be and they are also good tree climbers. Mountain lion sightings are few and far between but there are quite a few around. They will see you more often than you will see them. I have seen one in Lamoille Canyon but this was at night. A second sighting, but in a completely different location north of Elko, also occurred at night. Night sightings are up close but do not provide good viewing since the silhouettes quickly disappear into the darkness. 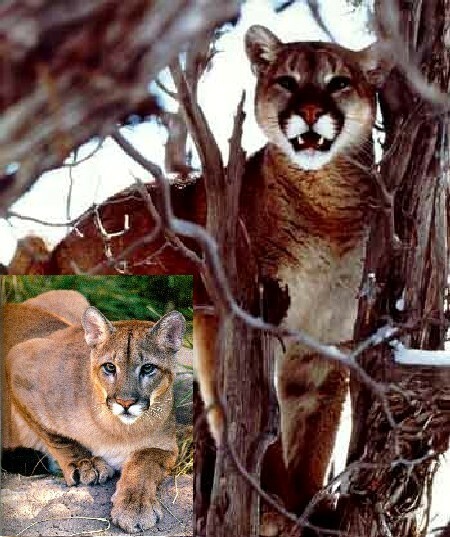 While there are various reports of mountain lion attacks on sheep or other livestock in the Ruby Mountains, there are no known reports of mountain lion attacks on people. When hiking, stay together as a group rather than stringing out individually along the trail. Safety exists in size and numbers. Mountain lions have been known to attack groups, but by far most attacks are against individuals. If an attack seems imminent, do NOT play dead. Lions kill for food rather than from a belief they are threatened. Instead, resist with whatever means are available--make noise, shout, throw rocks, wave a hiking pole or other object, raise your arms to look larger, anything to make the lion think it better look for easier prey. Running can trigger the chase instinct so do not run unless you can quickly get somewhere for protection before the lion gets there. Give the lion an easy avenue of escape if available, and, if the lion has seen you, do not crouch or bend over since this could give the impression that you are a small animal of prey. Bears? I would like to think so but bear reports in the area, at least within the past 100 years or so, are unknown. On one excursion, we had to pitch a tent at the Lamoille Canyon parking lot because of a very heavy and long lasting downpour during the night. Groceries were left in an ice chest outside the tent, and during the night some noisy foraging occurred just on the other side of the tent wall. I lacked the desire to go out in the rain and confront whatever it was. Come morning, it was discovered that the culprit had gained access to the ice chest and had completely devoured a whole berry pie and other food items, leaving only the aluminum pie plate. This sounds like typical bear-like activity but a badger was probably responsible. Coyotes are common to the area. I don't think a coyote was responsible for the above incident since coyotes tend to be rather messy. Whatever raided the ice chest was very tidy and didn't leave any mess to clean up. A howling pack of coyotes can be frightening, especially at night. We know one individual who became disoriented at Favre Lake and took the path of least resistance in the opposite direction down Kleckner Canyon--at night without a flashlight. Not a comfortable position to be in. He reported that he was constantly plagued by nearby howling coyotes all night long. You don't hear very much about wolves but we did see one as we were returning down the road from Soldier Canyon during daylight. This fellow was dark grey in color, almost black, and half again the size of the usual coyote. It ran across the road in front of the car, stopped in the sagebrush briefly to look back, and then disappeared. The mountains are also home to bighorn sheep, mountain goats, elk, and mule deer. Bighorn sheep and mountain goat sightings are quite common but most of the times they are at some distance away. For a totally unexpected deer encounter, a young doe calmly walked up to within arm's length like she wanted to be petted. Thinking better of this, since an extended hand might be just the thing for lunch, we just had a staredown until she slowly turned around and walked away. The upper left insert image shows two mountain goats above Boulder Lake and the lower right insert image shows two large bighorn sheep in the Echo Lake area (expand image for better viewing). There are beaver dams along Lamoille Creek and along other creeks in other canyons and beavers to go along with them. With some luck I was able to release a young beaver that had been caught in a leg hold trap. Fortunately it was trying to pull away in the opposite direction which made the release possible. A full grown beaver, probably thinking that I was responsible for his situation, may not have been so accommodating and might have put up a fight. 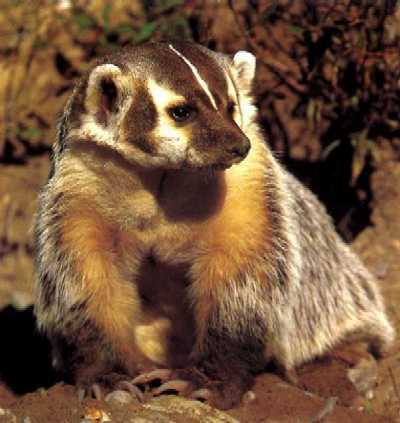 There are skunks, bobcats and weasels that are only rarely seen. 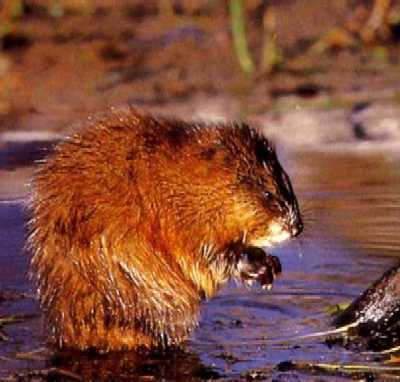 Mink and muskrats probably live around the beaver ponds (the trap holding the beaver was most likely intended for mink). Numerous mink and muskrats and some beaver do make their homes in the Humboldt river just a few miles away. Grouse, sage hen and chukar partridges are common, and the area boasts that it is home to the only band of Himalayan Snow Partridges, commonly called Himalayan Snowcocks, in North America. Web site http://gbwf.org/francolin/hsnow.html shows an excellent photo of a snowcock. The bird is quite large, primarily white and brown with some black streaks. Water is usually plentiful in the forms of creek water, snow runoff and springs that is usually safe for drinking, especially from springs, but be aware that there is a constant threat of giardiasis (parasite caused intestinal sickness) in western streams. These natural sources should ideally be purified or filtered. A good practice is to carry one or two plastic containers of bottled water and replinish from springs when they can be found. Small trickletts of water coming down hillsides are quite often from springs. 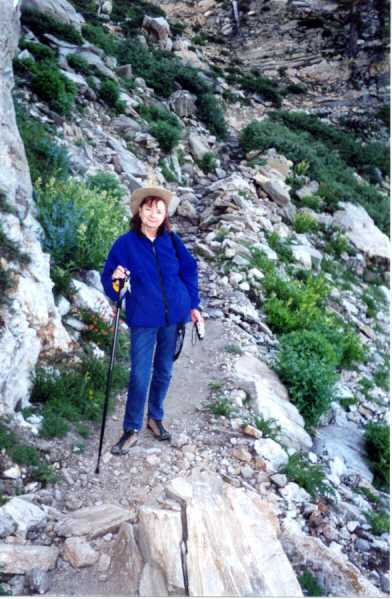 My Ruby Mountains Discover natural areas that can be "owned" by learning everything possible about them. You can own sites in the beautiful Lamoille Canyon, a major canyon of the Ruby Mountains located in Northeastern Nevada. Site Author Larry Hyslop has several books published, two of which relate to the Ruby Mountains, "Visitor's Guide to the Ruby Mountains" and "Hiker's Guide (to the Ruby Mountains)". A complete list of books can be found at Gray Jay Press. Hiking in San Diego provides timely hiking, backpacking or trekking (your choice of terminology) tips that can benefit even the seasoned hiker. Hiking gear is covered extensively and includes the admonishment not to over pack. The most experienced hikers can usually be identified by the lightness of their packs. 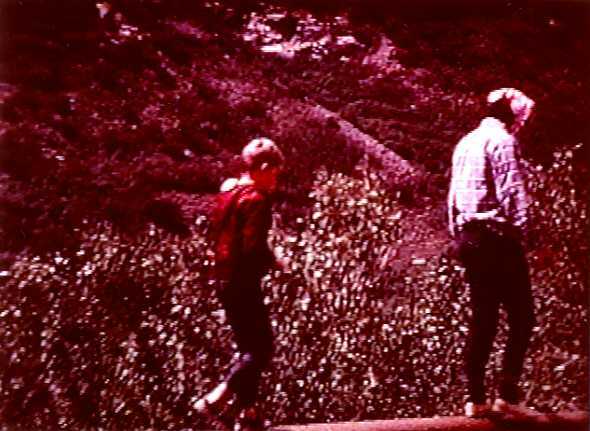 Some California hiking areas are introduced. Grand Canyon Tourist. Find information about the Grand Canyon in Arizona. Resources and information can be located on hotels and tours for hikers and travelers to make the most of their time and money during their visit to the Grand Canyon. From Ontario, Canada, Camp Pathfinder is a classic and historic boys' camp, offering summers of adventure for ages 7-16. Located on Pathfinder Island, Source Lake, in world-famous Algonquin Provincial Park. Pathfinder is all about exciting sports, awesome canoe trips, terrific counselors and great friends! Camp Pathfinder for Canoe Trips, Archery, Rope Climbing and Worlds of Adventures. One of Canada's best since 1914. Looking for new hiking, biking, or horse trek areas, visit Hiking with Darin. A Guide to Hiking in the Portland Area. And for those who don't get far out of southern California, locations include Orange, Los Angeles, and San Diego counties. Particular attention is given to the Santa Monica mountains. For Extreme Sports enthusiasts, pick out your favorites at Extreme Sports Galore for 19 pages, some 25 categories per page, of everything imaginable including hiking, water rafting, kick boxing, freeskiing, surfing, mountain climbing, paraglyding, scuba diving, and numerous others--where to do it, programs, fees if any, etc. During your next visit to New Zealand, be sure to take along your mountain bike, bungee jumping equipment, and cave abseiling lantern and link to Extreme New Zealand for locations where equipment can be used. Top Biking Trails for information on the Top 10 Biking Trails in the U.S.A. located in only four states: Colorado, Georgia, North Carolina, and Utah. Pacific Northwest Hikes--Washington State: This site presents approximately 150 hiking trails to destinations within Washington State. Included with each destination are: Type (such as lake, view, etc), Length in Miles, Approximate Hiking Time, Difficulty (1 to 5), Rating (up to 10--apparently refers to scenic quality or hiking recommendation), and Altitude Gain. Trail maps and Google Earth maps are shown in addition to directions to trailheads, seasonal or monthly accessibility, fees if any, general description of hikes, and contacts for additional information. Grand Canyon: If you are planning a hiking vacation consider a trip to the Grand Canyon. There is plenty of places for great hiking at the Grand Canyon and plenty of Grand Canyon lodging locations. You can also visit the new Grand Canyon skywalk while you are there. NevadAdventureS presents a collage of topics associated with the Elko area and other rural Nevada locations. Topics include hunting, fishing and camping information, outfitter information, locations of Nevada ghost towns, where to go in and around Elko, and much more. Cruise Nevada provides links to informative Nevada web pages which include such topics as culture, government, education, regions, environment, travel and tourism, recreation and sports, business and economy, and others. Backpacking the Ruby Mountains contains some extraordinary photos of bighorn sheep, mountains goats, deer and other wildlife that make their homes in the Ruby Mountains. Some excellent lake photos are also provided along with trail information to many of the lakes. Contact the Elko Convention & Visitors' Authority for setting up meetings, workshops, conferences, reunions and conventions. The staff can suggest recreational, musical, historic, cultural, touring, and other unique components that harvest memorable events. Lowell Prunty Jarbidge Backpacking and Outfitters Jarbidge is located in Nevada about 100 miles north of the Rubies and just south of the Idaho border. The Rubies and East Humboldts can't claim all the majestic Nevada landscape, there's plenty more to be had around Jarbidge. Gray Jay Press is located in Elko, Nevada near the Ruby Mountains. This small press offers nature books on Zion, Arches and Canyonlands National Parks, along with guide books, including hike descriptions, for the Ruby Mountains and East Humboldts, as well as the California Trail. Rock Climbing Headquarters Everything Rock Climbing from A to Z, from Adam Ehrlich Rock Climbing to Zion Rock Climbing. 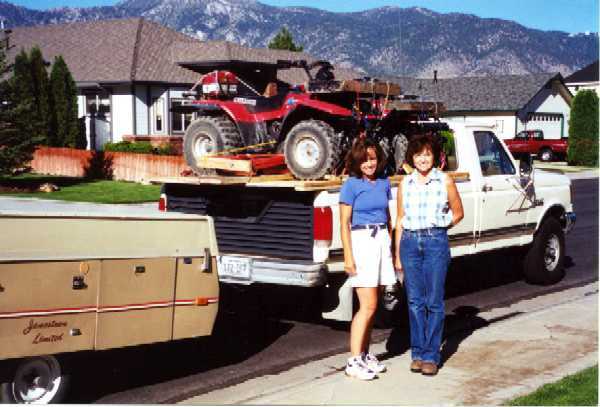 Discover Nevada Trip (June, 99) good photos and fishing information for Lamoille Canyon, Wildhorse Reservoir (north of Elko), and Angel Lake. The date is early June which accounts for all the snow still remaining in Lamoille Canyon and the accompanying grayish-brown bleak landscape. The author makes the following statement about the canyon: "This place had been lifted out of the Canadian Rockies and placed in Nevada." Taiga Works Outdoor Gear and Clothing Store TAIGA's outdoor clothing & active wear, including equipment for adventure travel & trekking, hiking, backpacking & mountain equipment, survival gear & ski wear, cycle shells & boating wear, are legendary for quality and superb performance in expeditions around the world. Vacationing in Canada: Hike Chilliwack British Columbia hiking club offers day hikes for people of all ages and fitness levels throughout the Fraser Valley including Chilliwack and Vancouver BC with photos, trail descriptions, maps, hiking photos and hiker profiles. Ruby Mountains Mountain Biker Blog by John Shafer Review photos and post your own mountain biker notes for trails and destinations in the Ruby Mountains. Additional photos can be viewed at Hidden Lakes and Verdi Lake Photo Albums. Currently 400 additional photos are available as 18 photos per page view (default) or switched to "View by Slideshow" for individual larger photos. The photo locations, however, are not identified. They display more or less in sequence along the routes to various destinations which may result in little variation between some photo sequences. It is not necessary to select an individual album since photos from both are combined. Two hundred photos from the Hidden Lakes album provide photos of Hidden Lakes, North Furlong, Liberty, Lamoille, Greys, Overland, Dollar and Island lakes. Two hundred photos from the Verdi Lake album provide photos of Verdi, Lost, Echo, Liberty, Favre, Island, Boulder, Steele, Cold and Overland lakes, and Liberty Pass. The idea for the construction of this site was provided by my wife Jean Marie Bennett Sheaks.